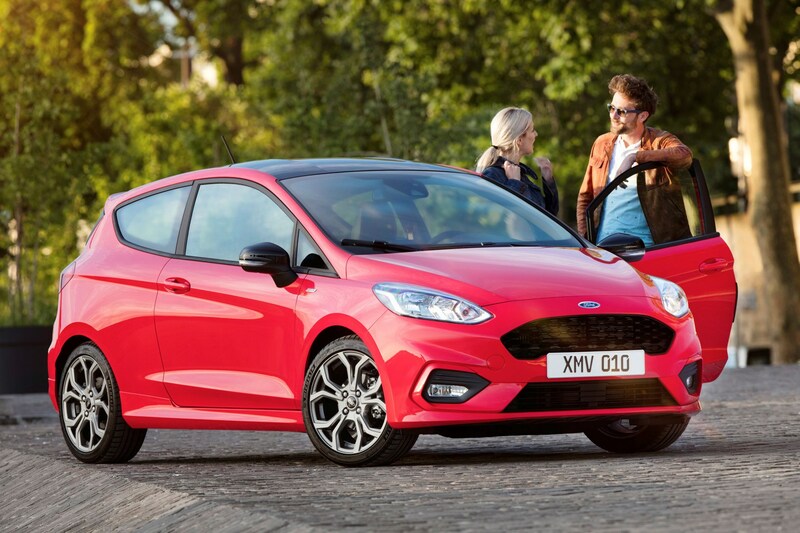 The majority of the petrol line-up uses a three-cylinder EcoBoost engine, with power outputs of 100, 125 or 140hp to choose from. 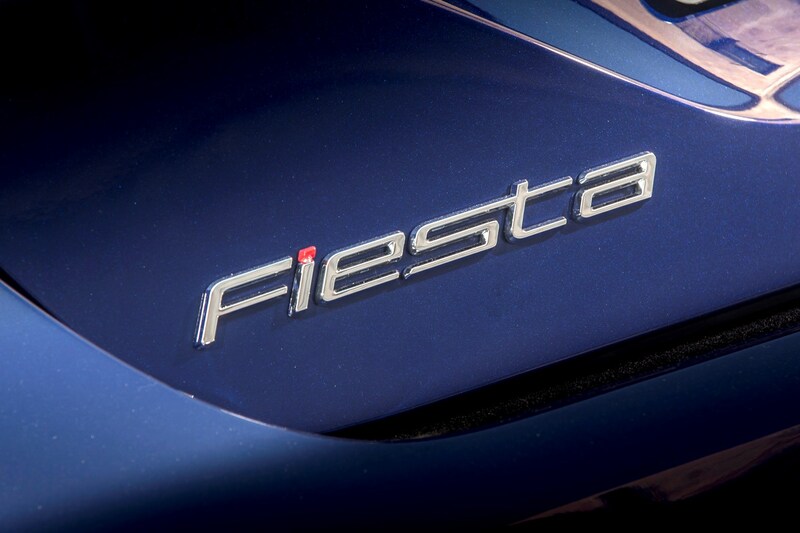 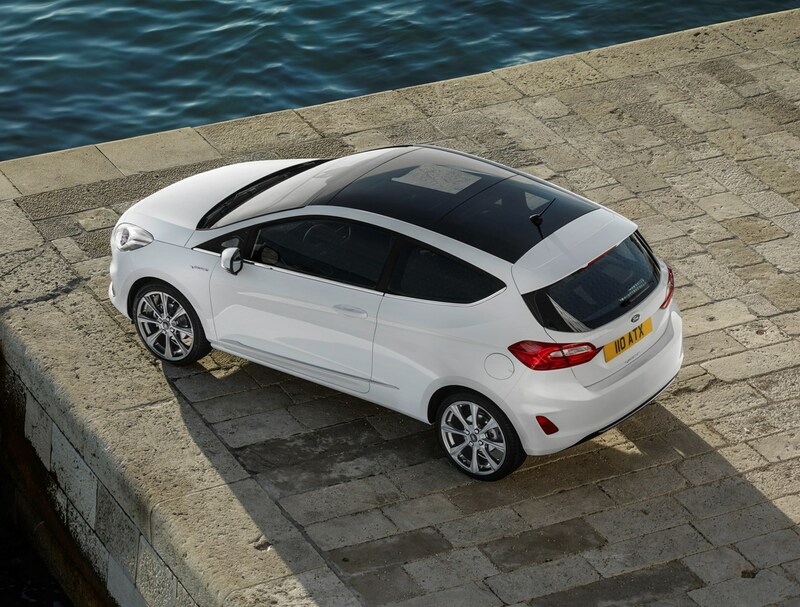 The entry-level 100hp version provides adequate power to shift the Fiesta along, but won’t set your pulse racing. 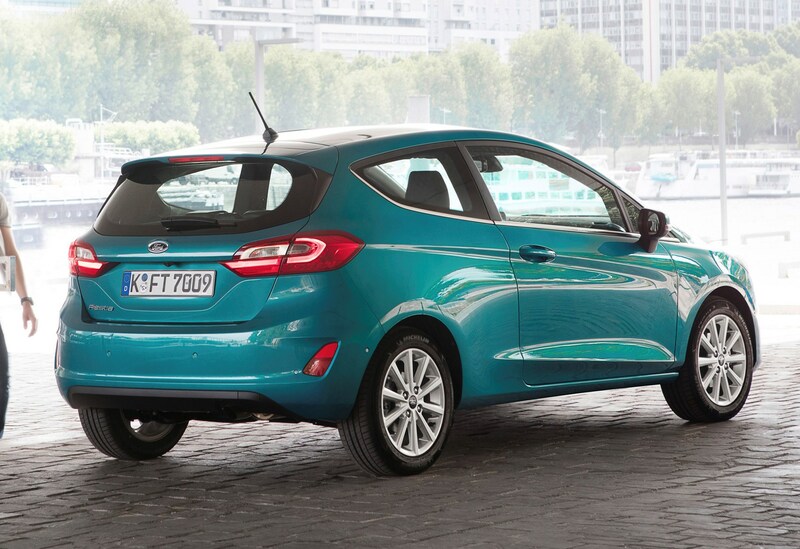 In reality it’s not that much slower than the 125hp or 140hp engines, but lacks a little of their mid-range punch. 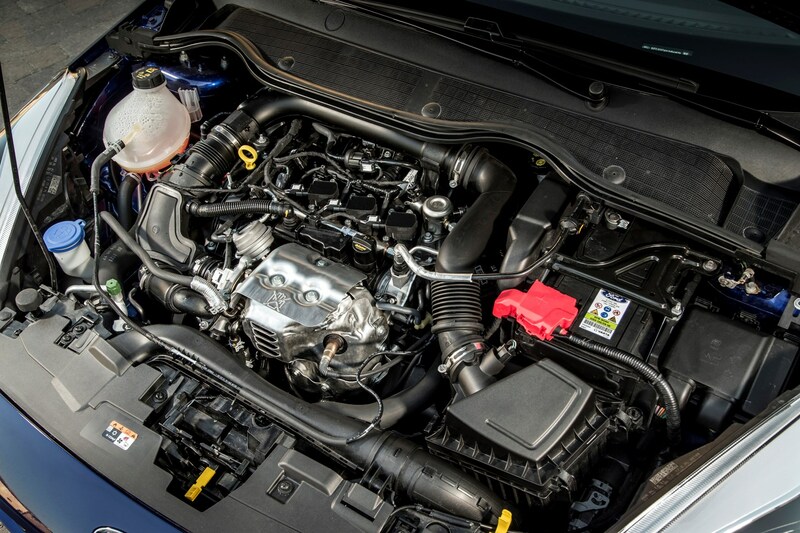 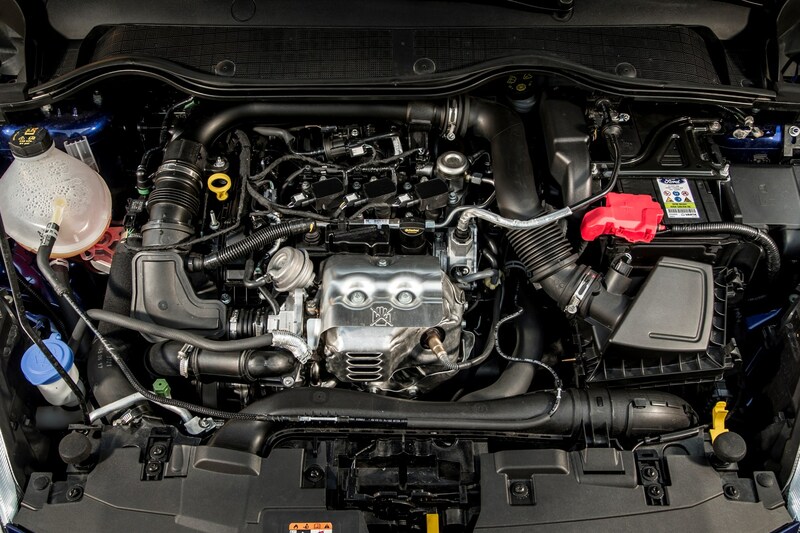 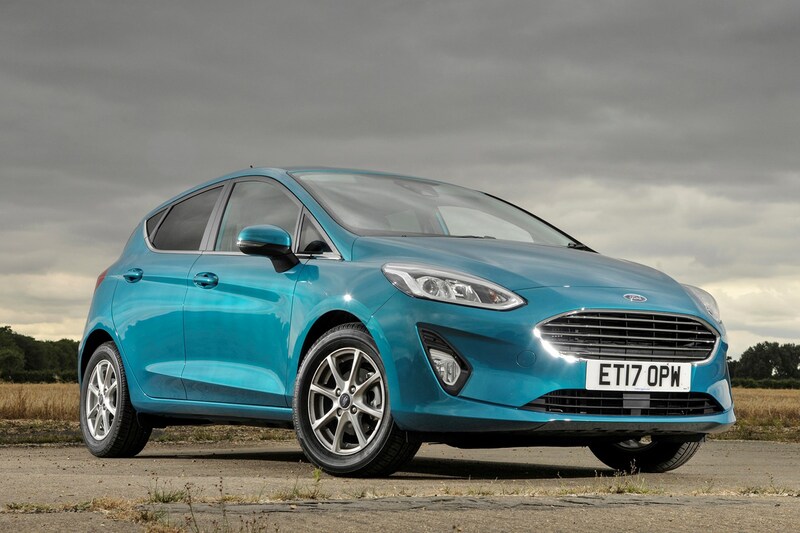 The 125hp EcoBoost is a great middle ground, offering more sprightly performance without the associated costs. 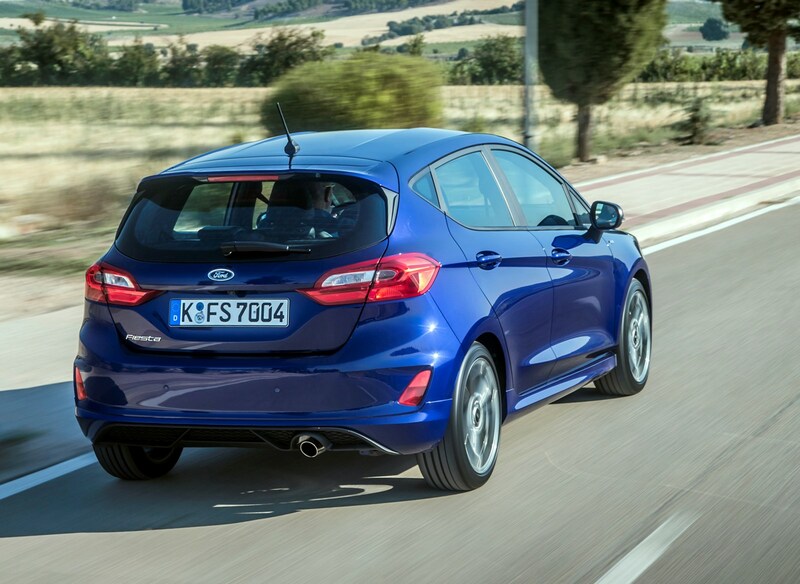 The real advantage however is the way it pulls from low revs, so you don’t need to shift down gears so often. 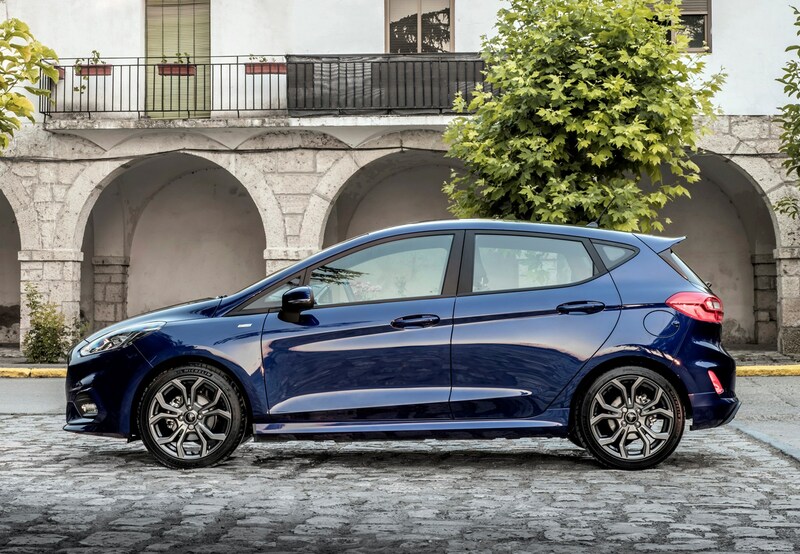 We think the 140hp engine is the best of the bunch, and as well it should be given it’s the second most expensive. 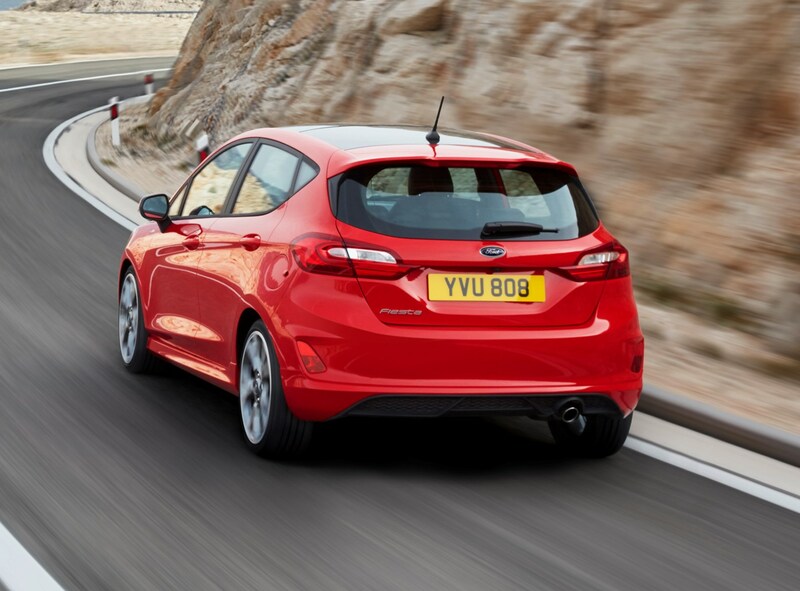 It’s extremely responsive and much smoother than we remember Ford’s three-cylinder engines of yore to be. 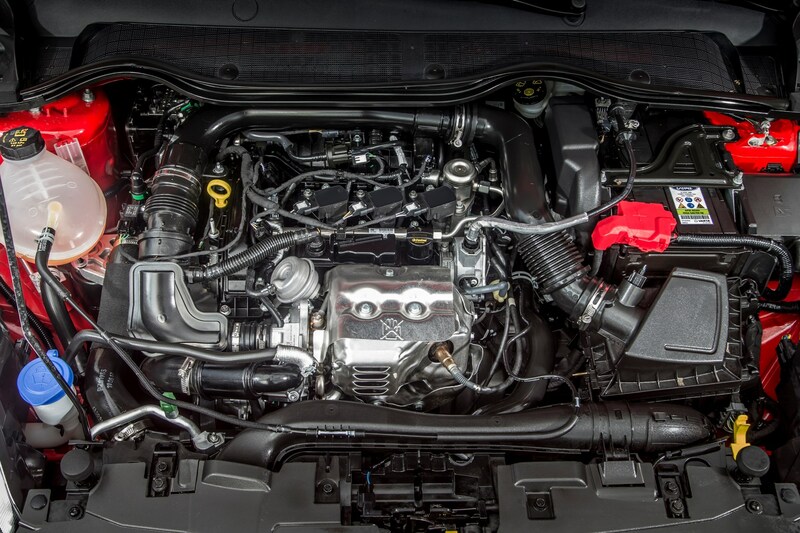 We came away impressed with the flexibility of this engine too – its power band is wide enough that you don’t have to change gears too often. 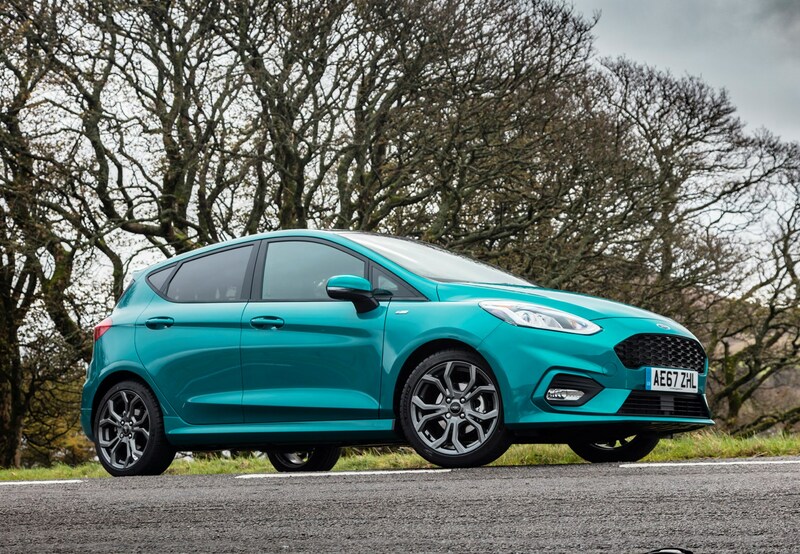 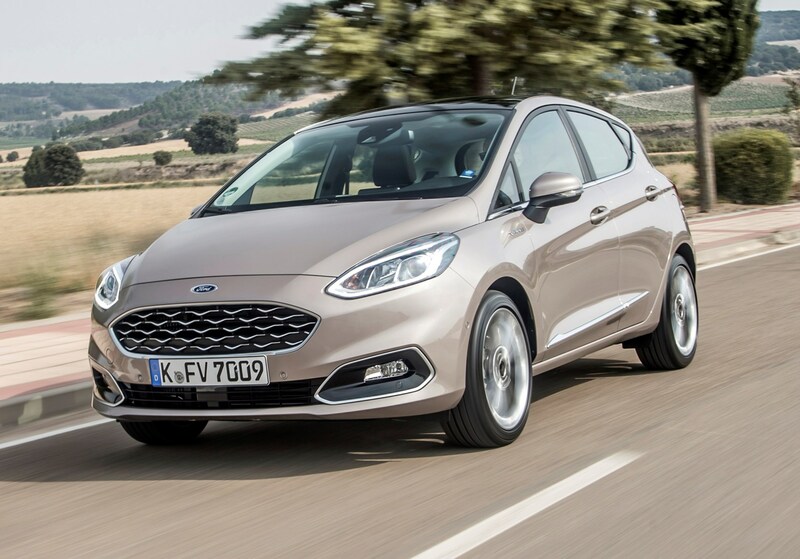 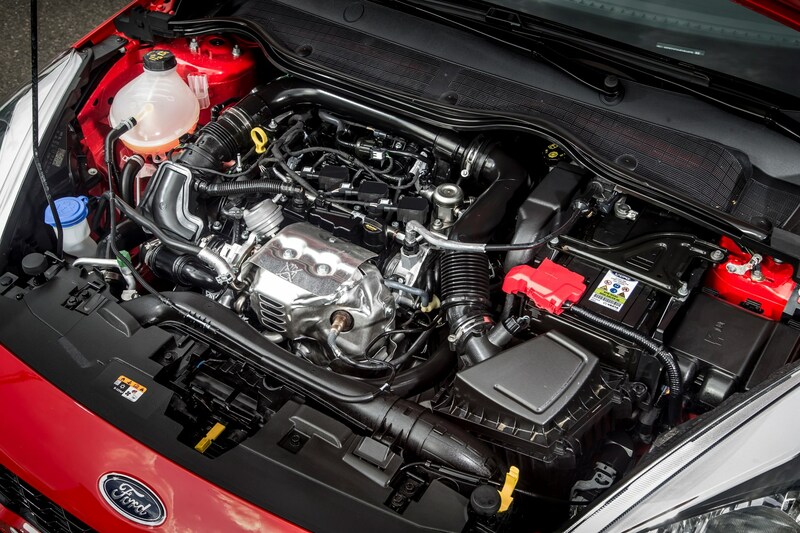 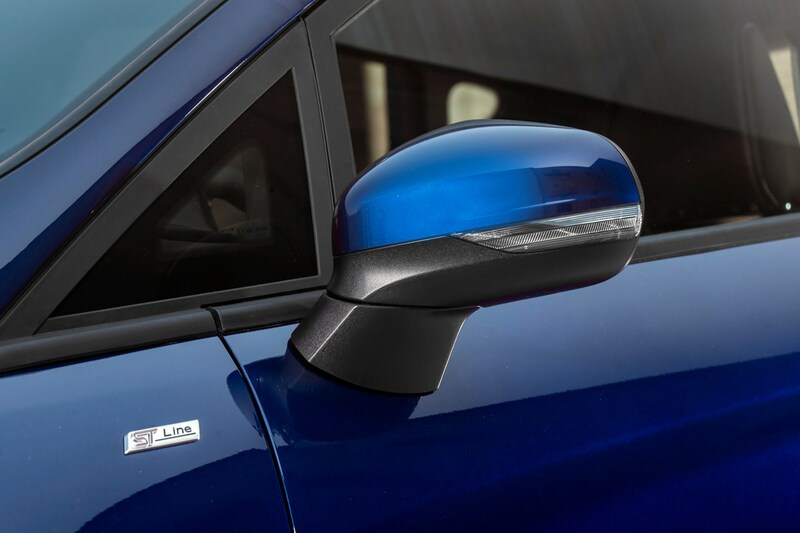 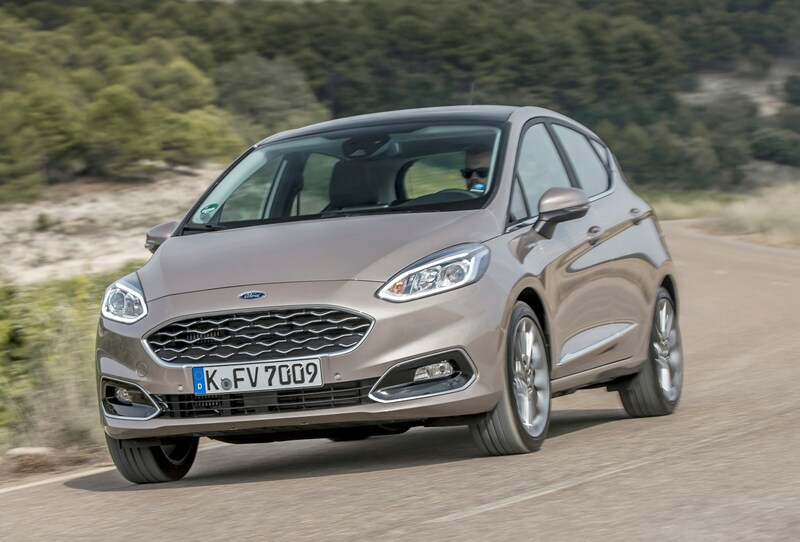 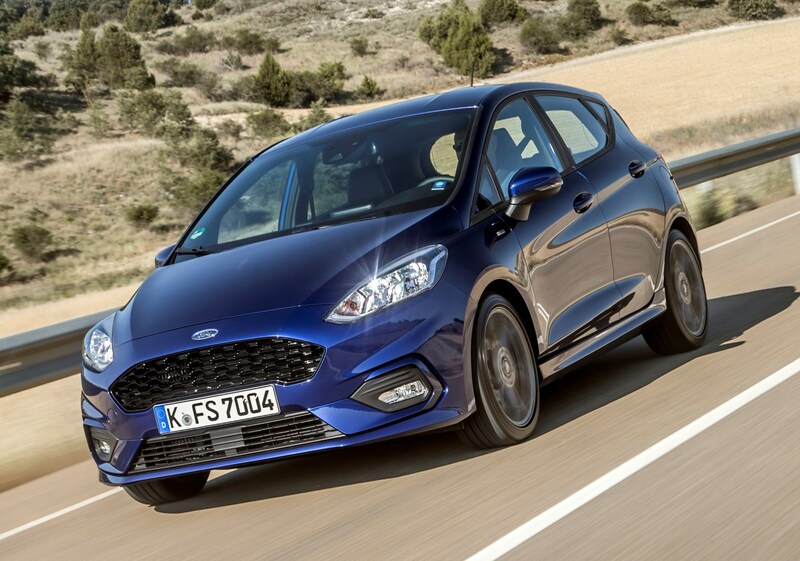 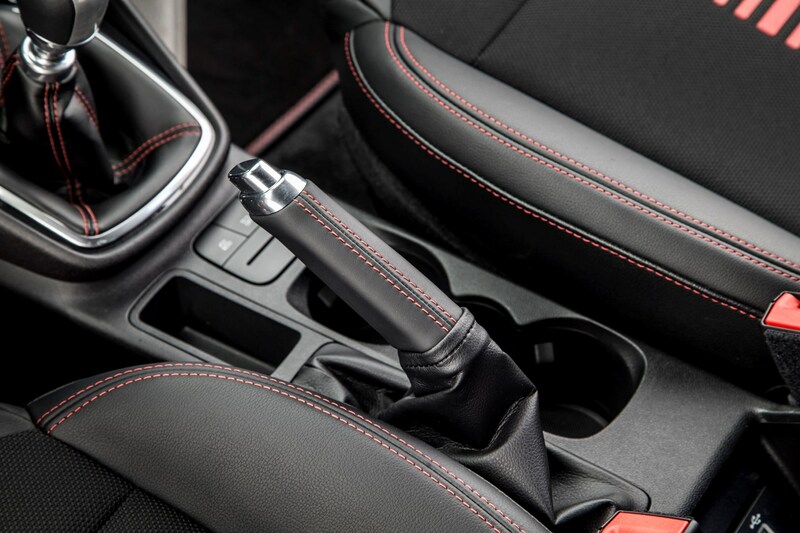 If you want an automatic gearbox there’s currently only one choice – perhaps reflecting the fact Ford reckons only 8% of Fiestas will be so equipped – the 1.0-litre, 100hp EcoBoost, with a six-speed torque converter ‘box, as opposed to a more modern dual-clutch transmission. 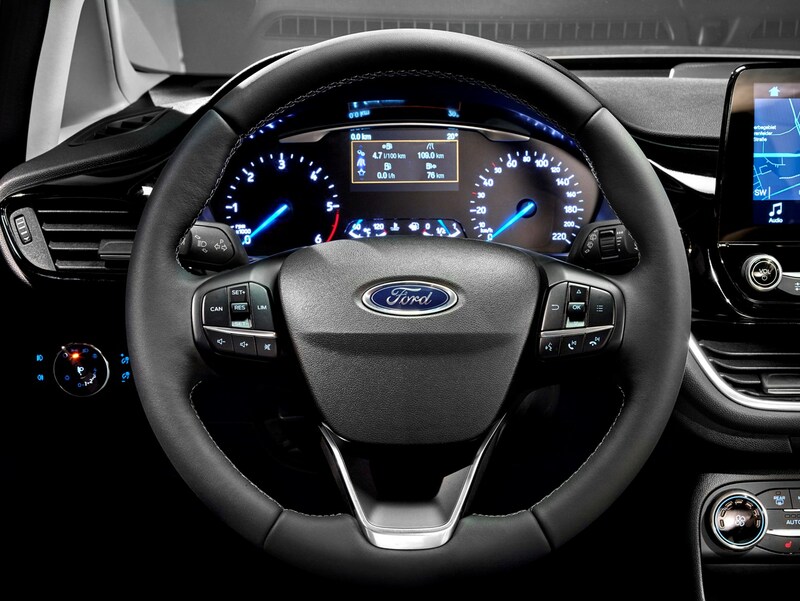 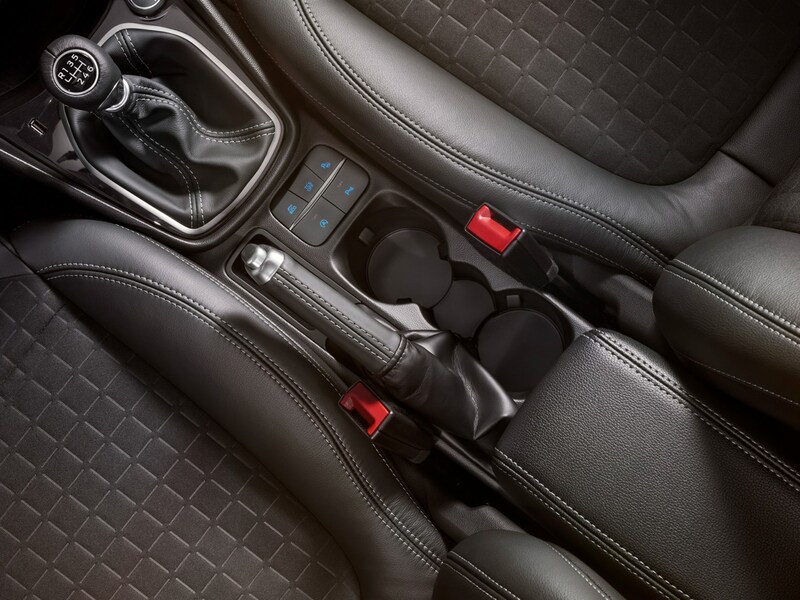 Don’t worry too much about the difference – the upshot is that it takes a little while longer to change gears than you might be used to, even if you make use of the diminutive steering wheel-mounted shift paddles. 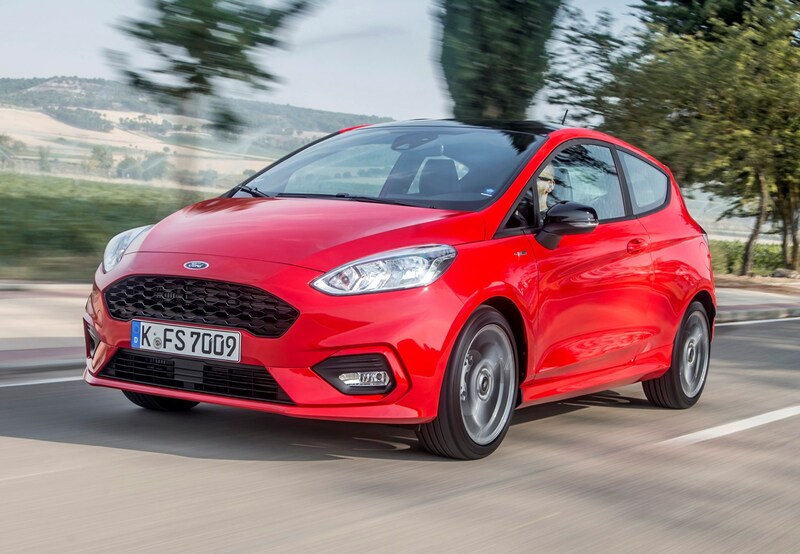 For the most part though, it’s a reasonably smooth gearbox and only becomes little jerky if you want to accelerate very quickly. 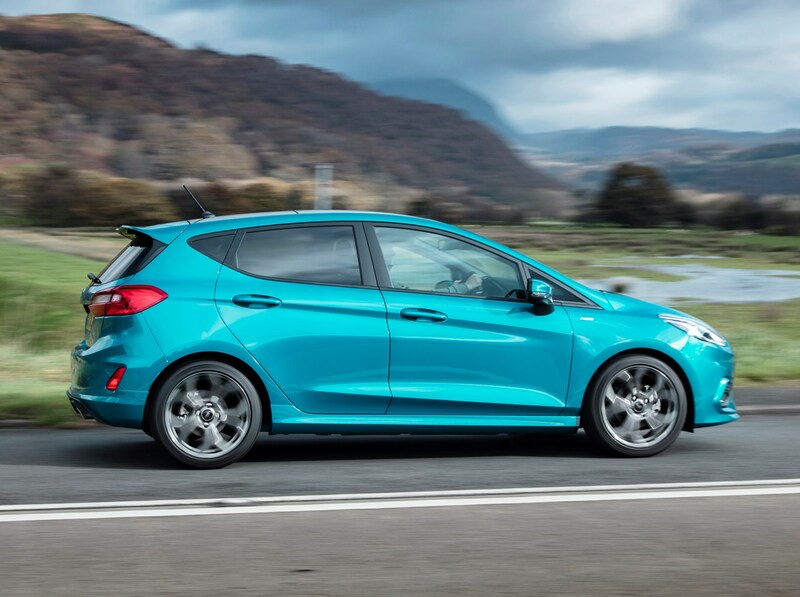 Although quick off the line, this drivetrain takes nearly two seconds longer to get from 0-62mph than the manual, so it’s probably best to pick that if you prioritise performance over convenience. 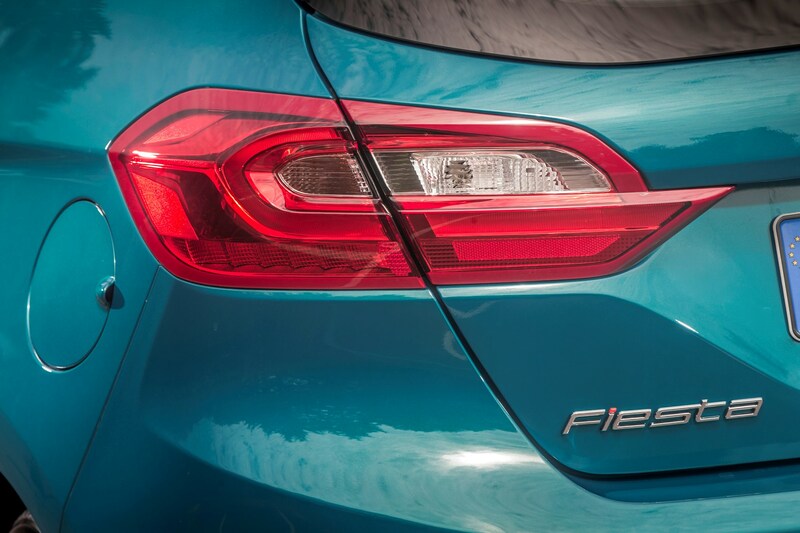 The higher-powered diesel is an altogether very impressive unit that won’t leave drivers feeling short-changed, but it is expensive relative to all other motors. 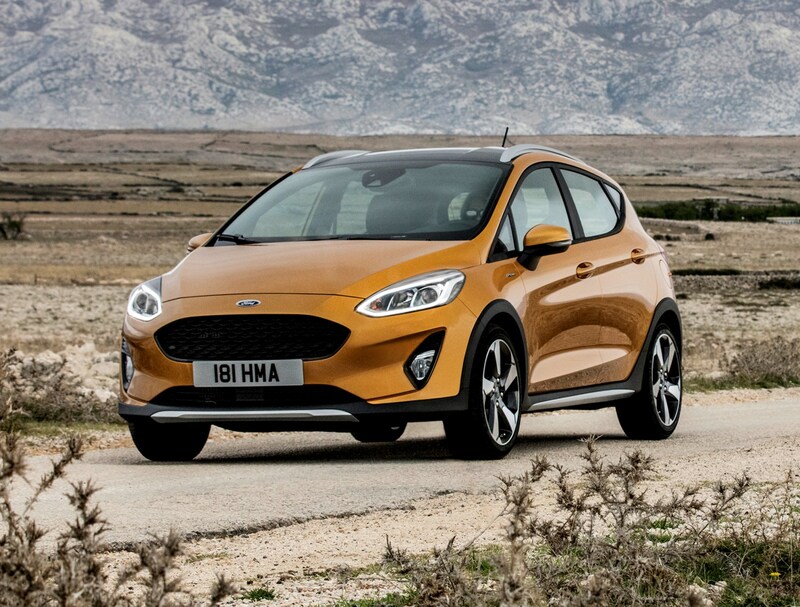 It’s not quite as smooth or responsive as the 1.0-litre EcoBoost petrol, but it is compared to many diesels, and during our test it registered around 10mpg better during mixed driving. 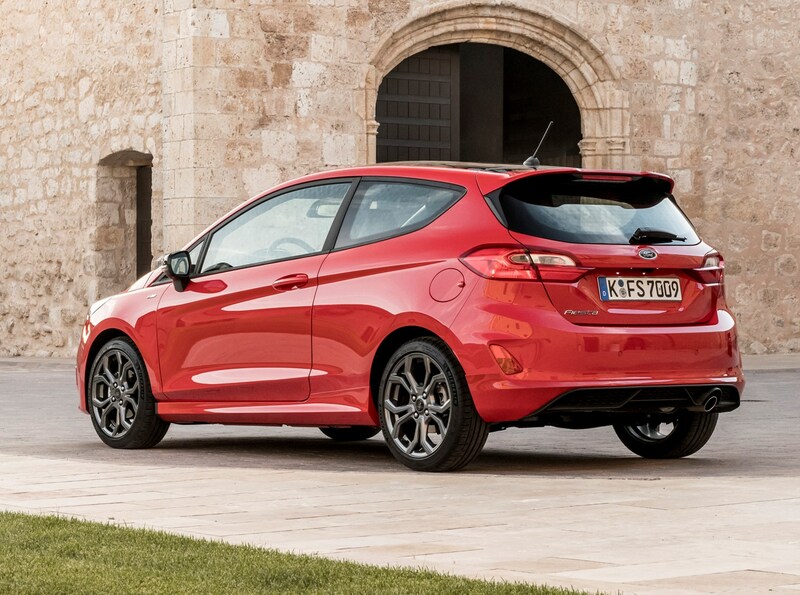 That’ll be enough to swing it for many. 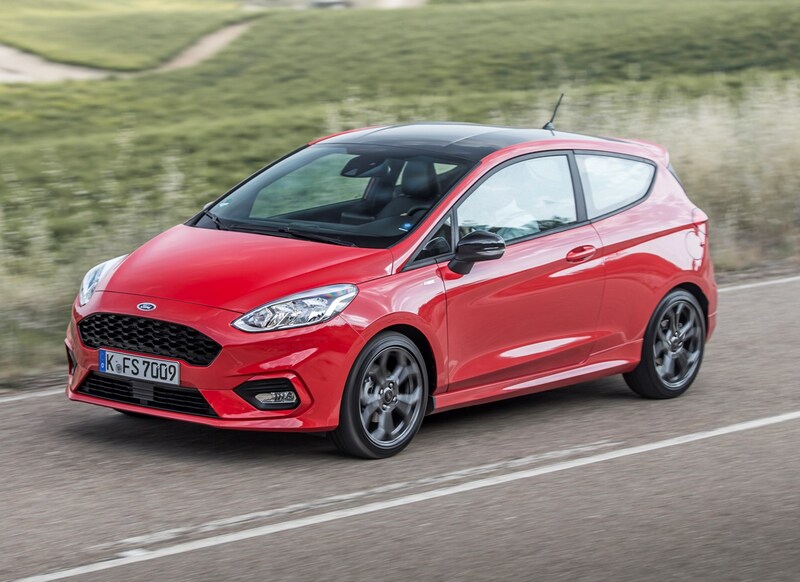 The previous Fiesta ST was widely regarded as one of the best hot hatches you could buy, and 2018’s version looks set to continue that trend. 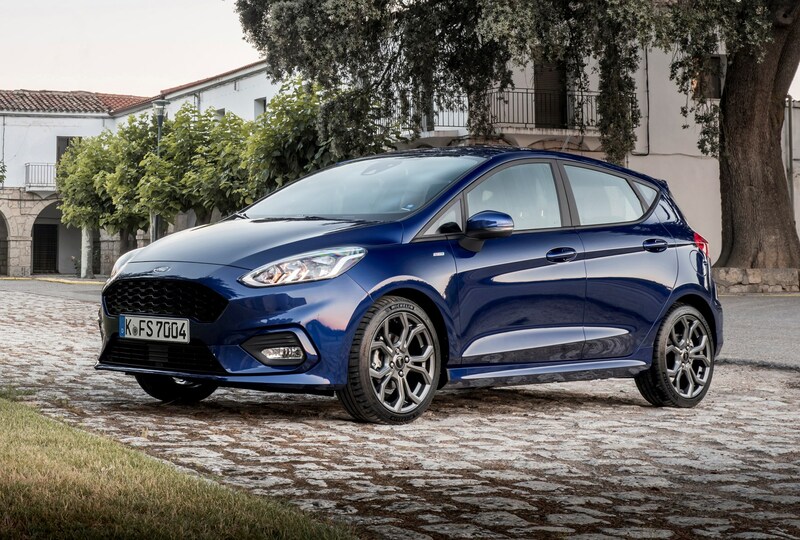 The recipe is very similar, albeit with a 1.5-litre turbocharged three-cylinder engine under the bonnet in place of the 1.6-litre four-cylinder of before. 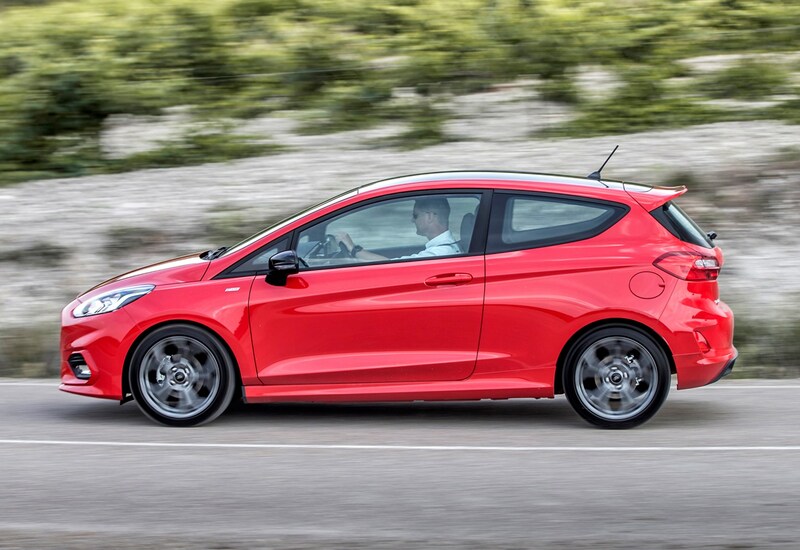 Here’s an interesting fact about the Fiesta’s handling: Ford’s engineers have dialled back the resistance of the steering by around 20%. 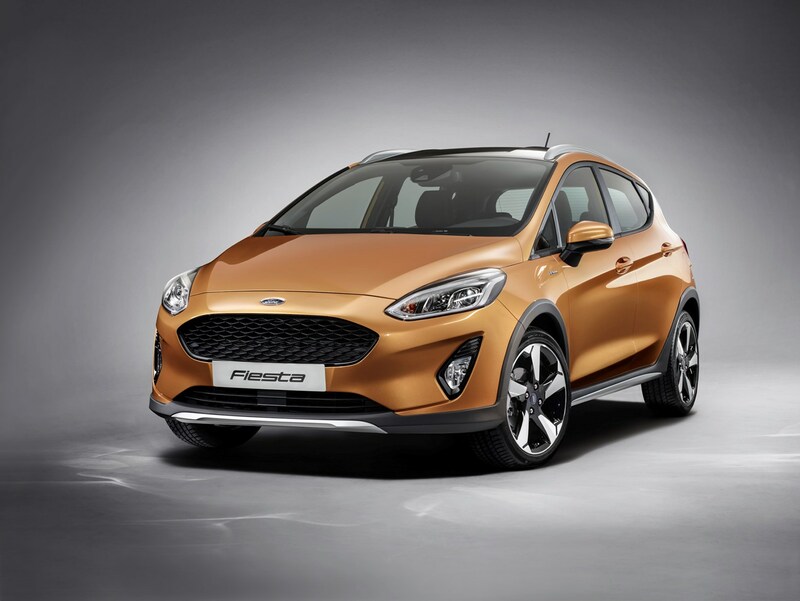 This is the polar opposite of what many firms are doing these days – adding extra weight that they assume translates to ‘feedback’ about what the front wheels are experiencing under the car. 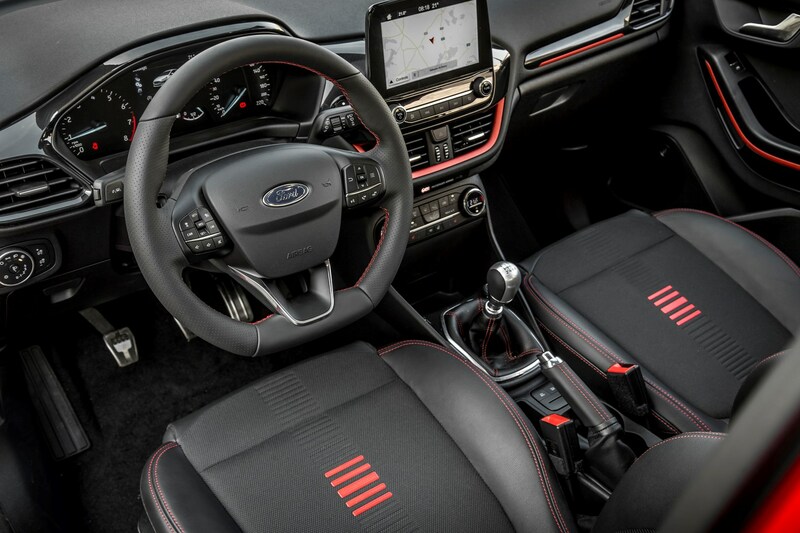 So on the face of it you’d think Ford’s approach might make for steering less impressive than before, but you’d be wrong. 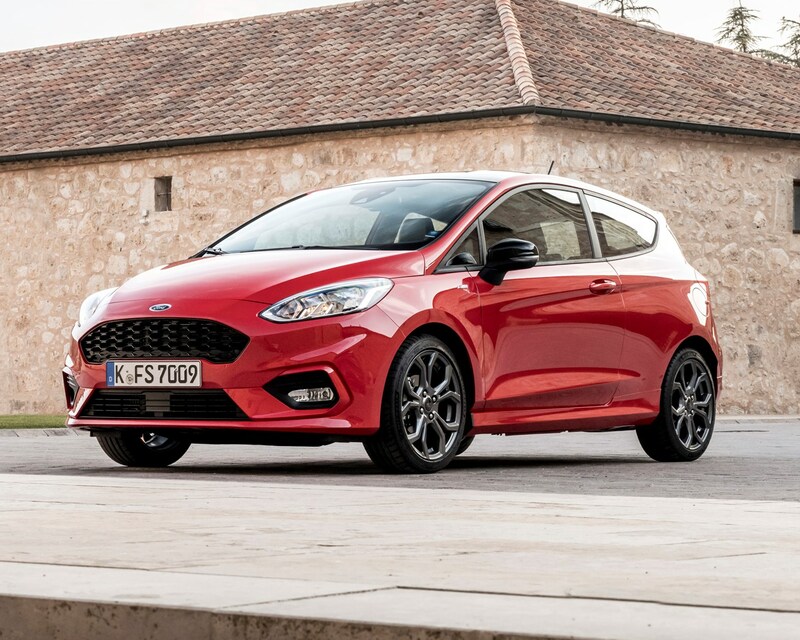 It does feel lighter for sure, but instead there’s a wonderfully immediate and predictable response on initial turn-in. 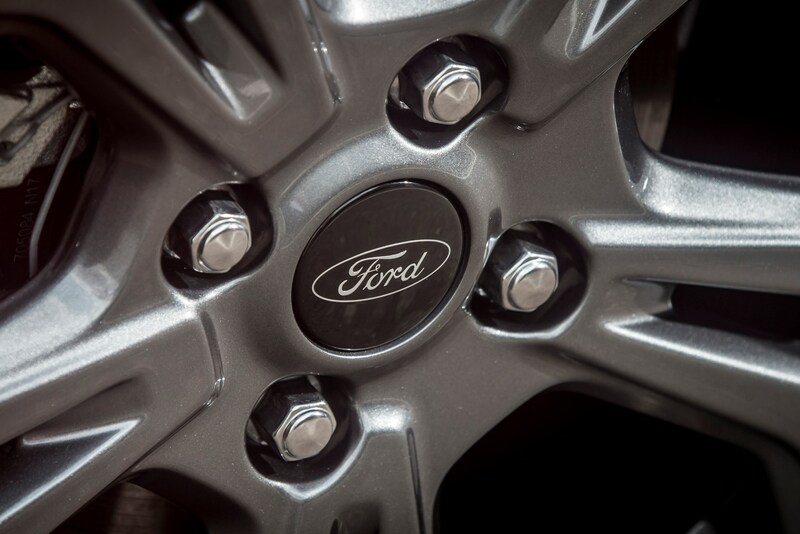 This is something Ford is a master at, and it shows. 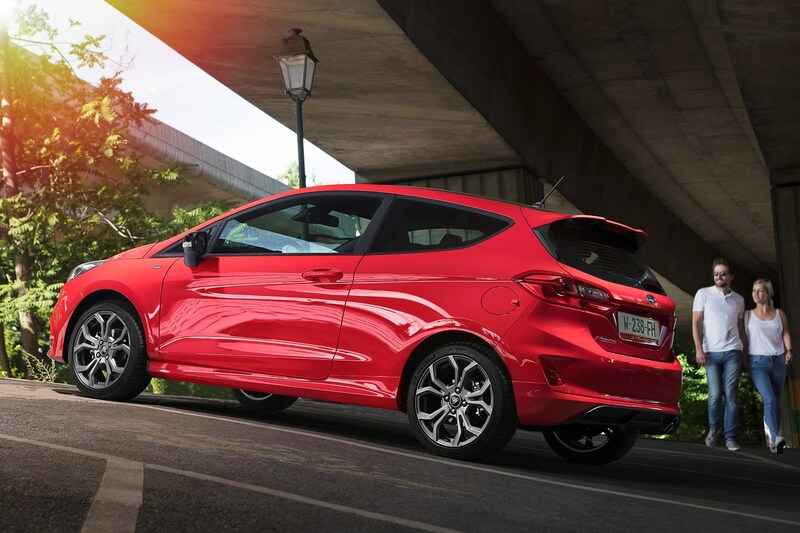 You can flick the Fiesta across bending B-roads with huge amounts of confidence because you can tell exactly what it’s going to do. 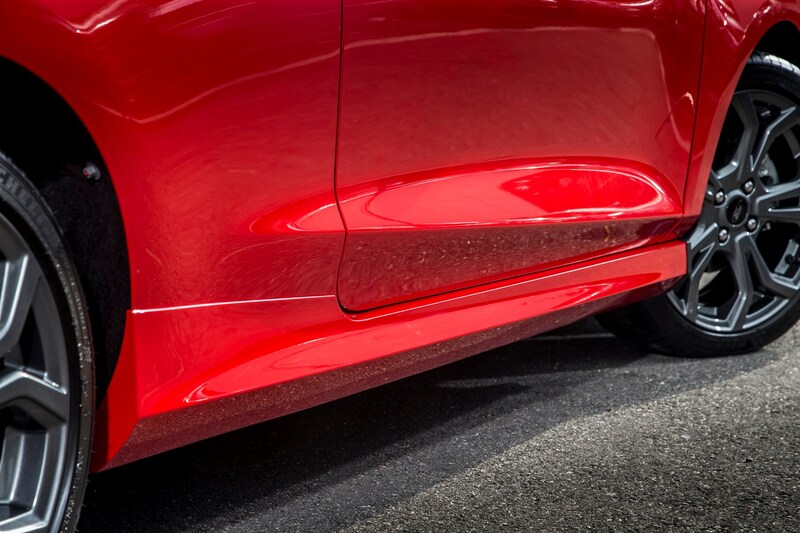 In fact, the whole chassis is a masterpiece. 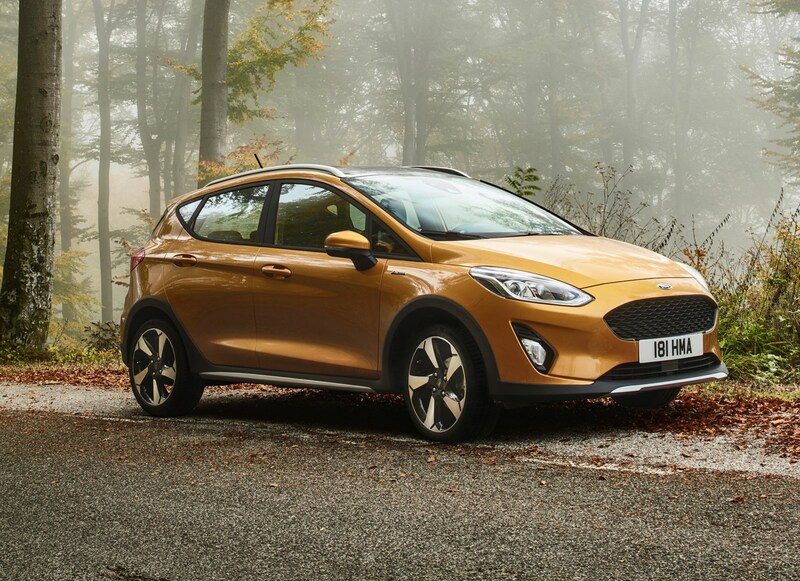 The amount of grip is higher than ever, but it’s the way it instantaneously corners brilliantly and soaks up lumps and bumps in the road that really stand out. 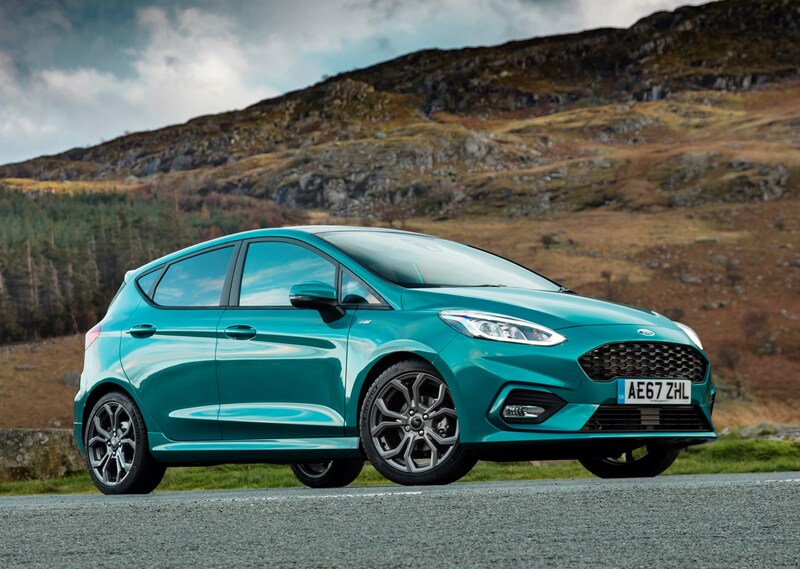 In fairness the seventh-generation Fiesta was particularly good at this too, but jumping out of rival cars it’s very noticeable indeed. 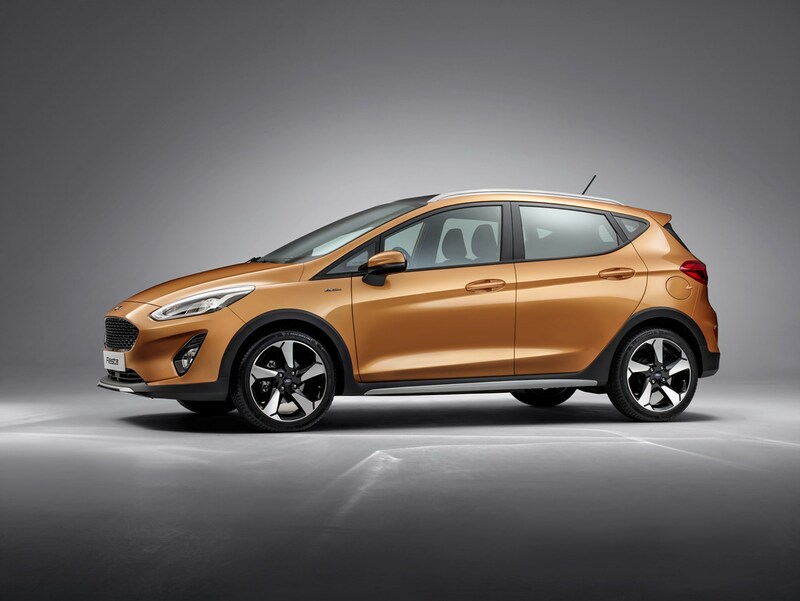 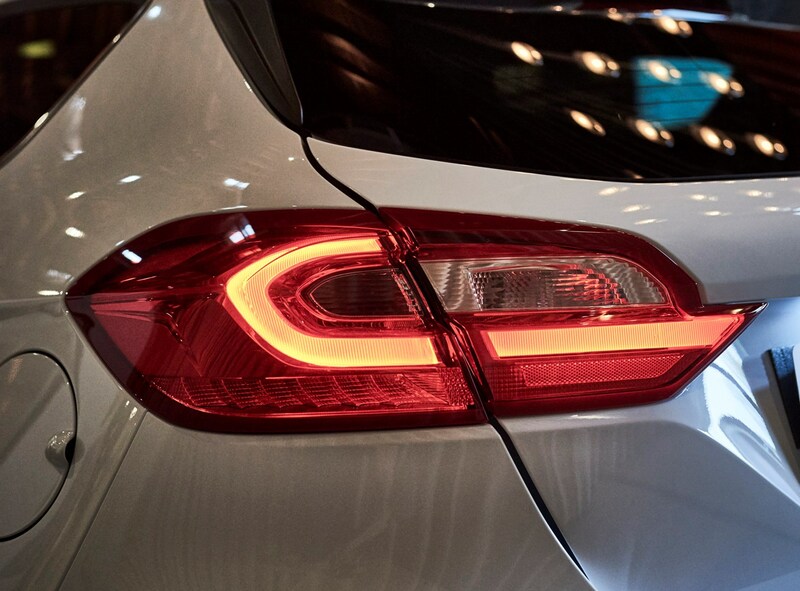 The Fiesta’s turning circle isn’t the largest in the sector but we’re pleased to confirm a three-point turn is possible without too much in the way of driver arm-flailing. 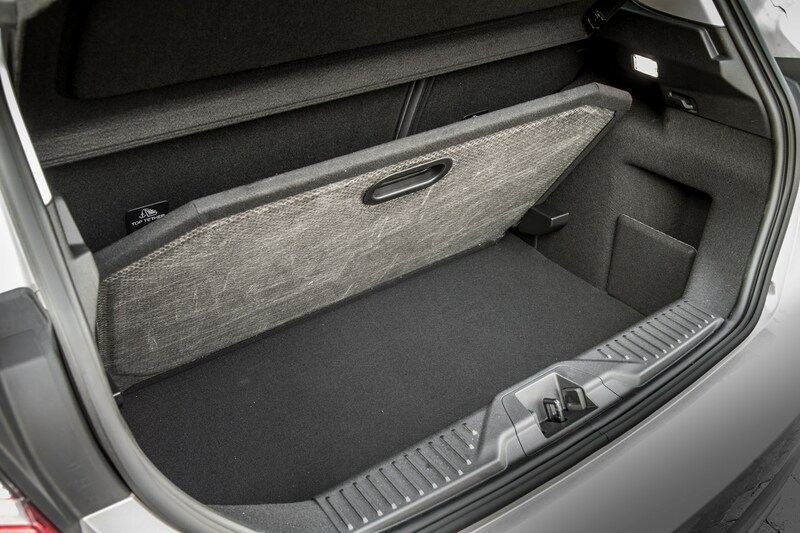 Parking is easy, and easier still if you’ve got the acoustic sensors or automatic parking system in higher-spec trims. 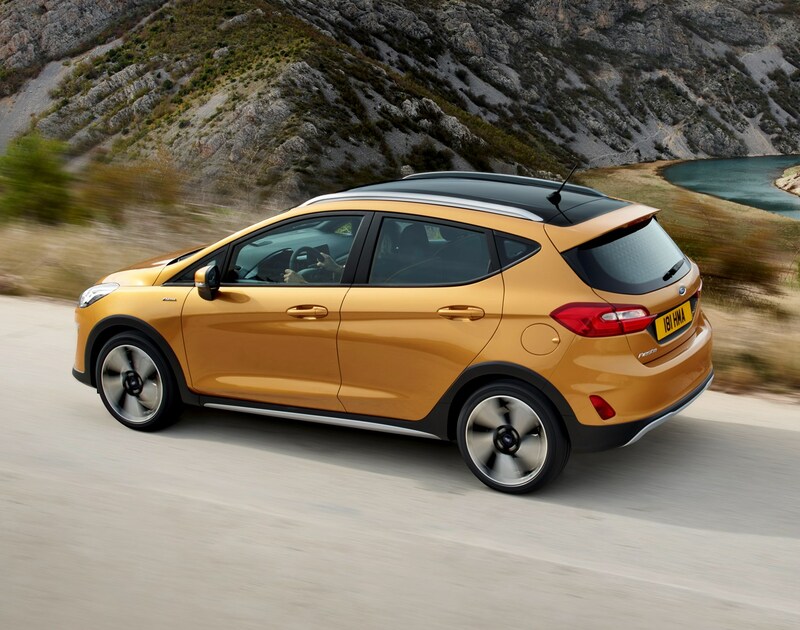 Ford’s technicians have done lots of work on the brakes, too, with a sharper initial bite and far shorter stopping distances. 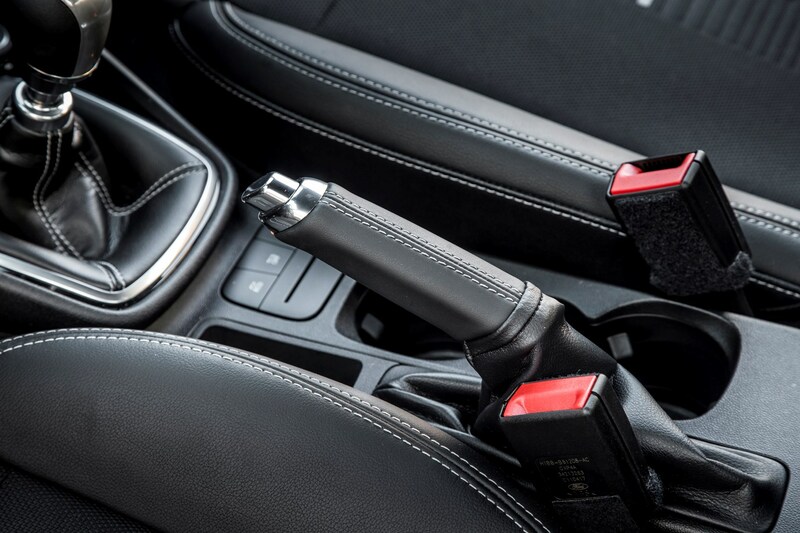 This doesn’t translate to a ‘grabby’ pedal feel, though – like the rest of the car’s handling it feels very well resolved. 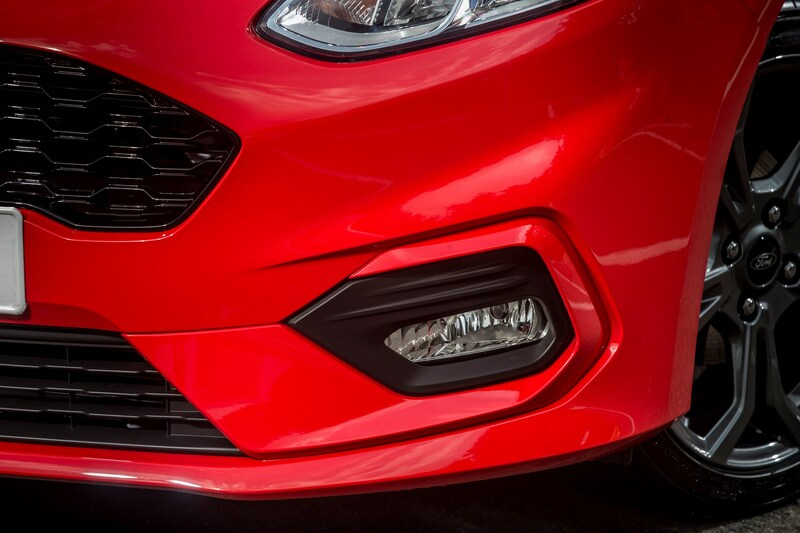 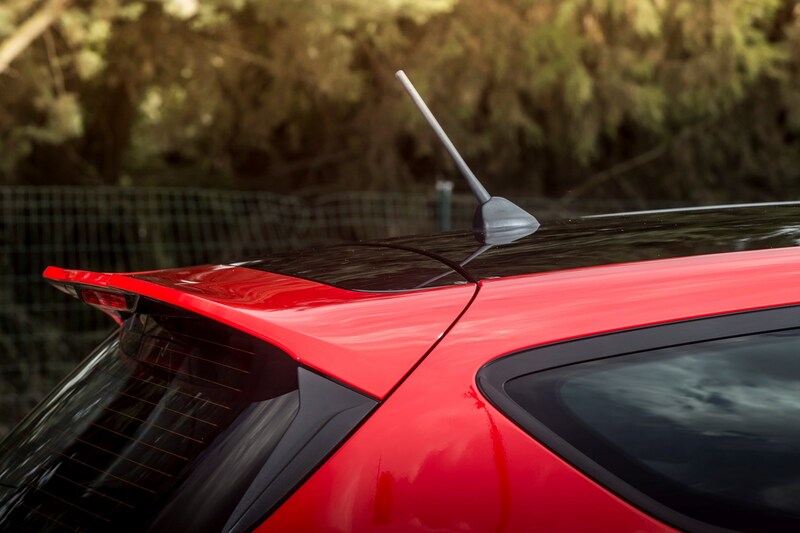 How does the Ford Fiesta ST-Line handle? 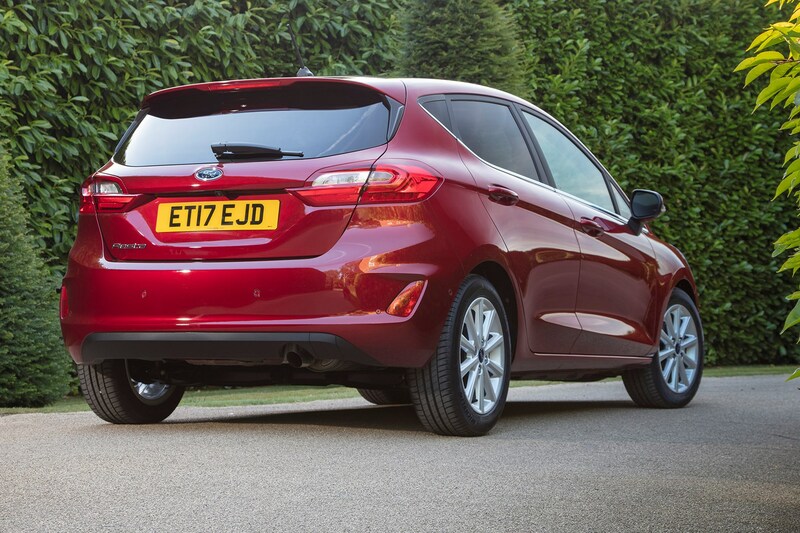 Even better than the rest of the range we’ve tried so far. 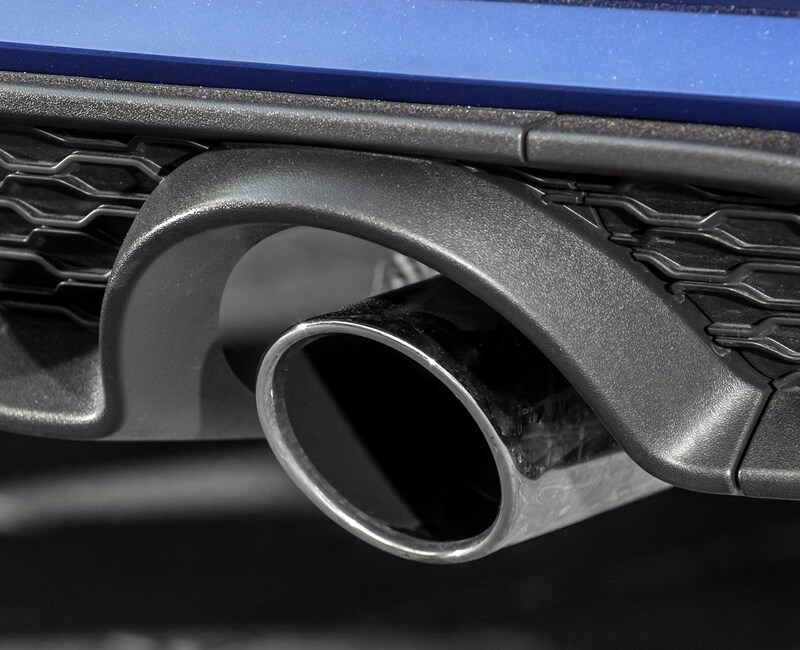 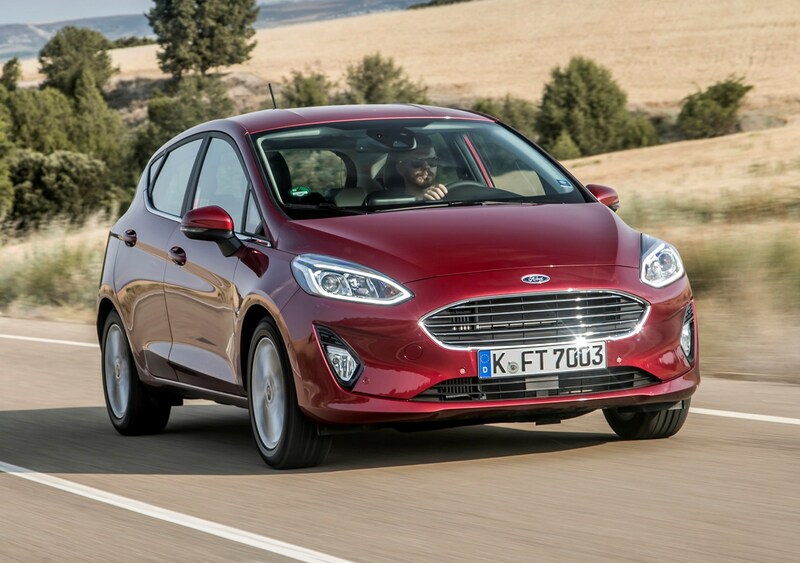 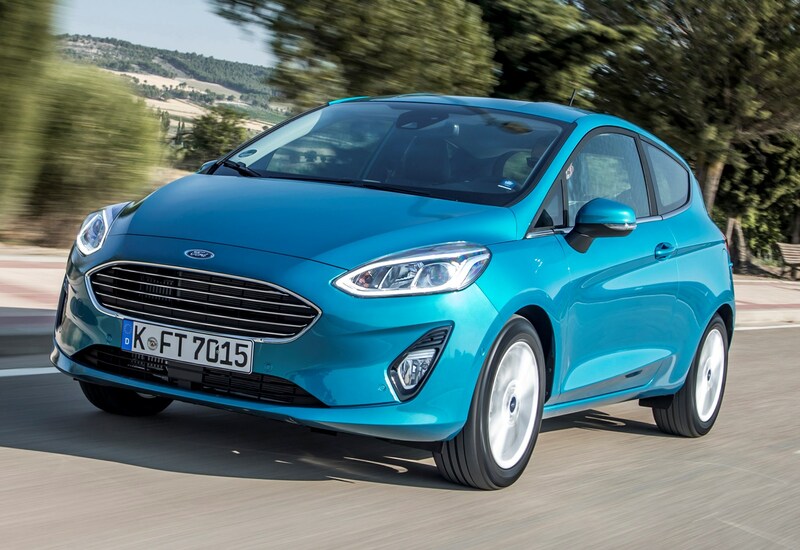 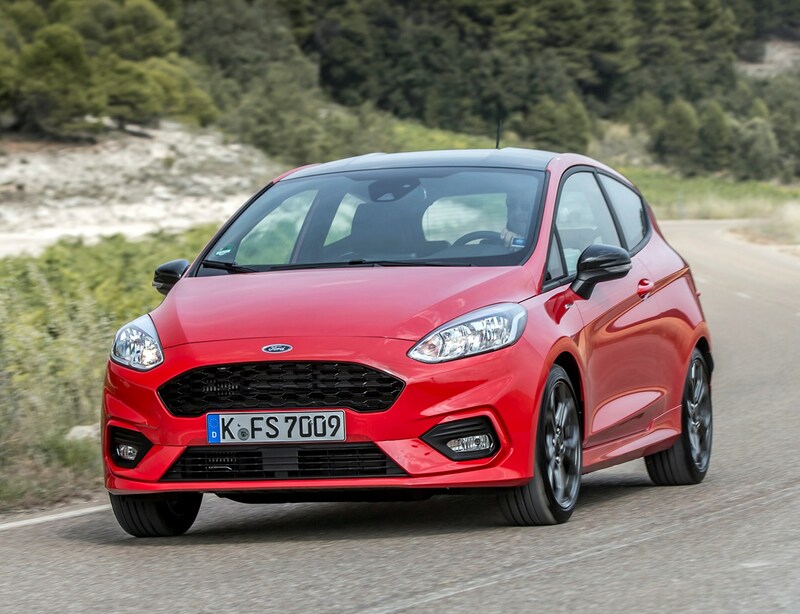 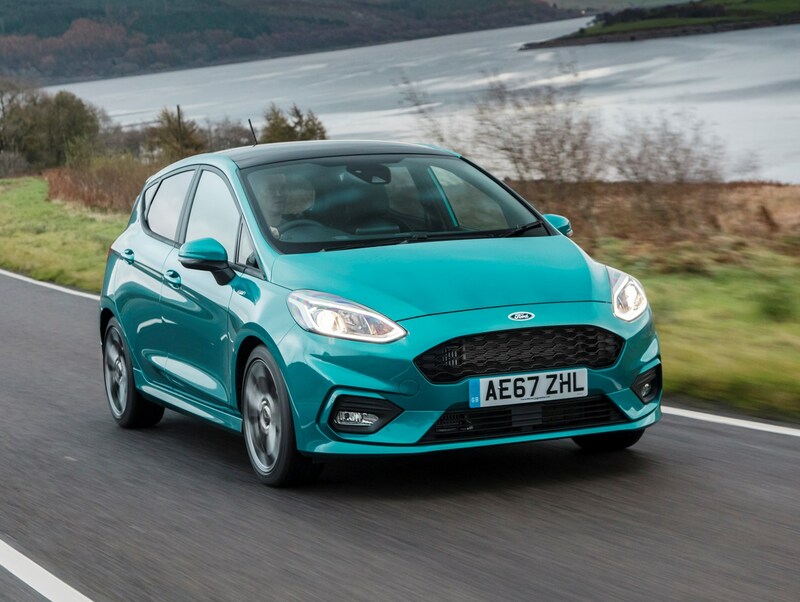 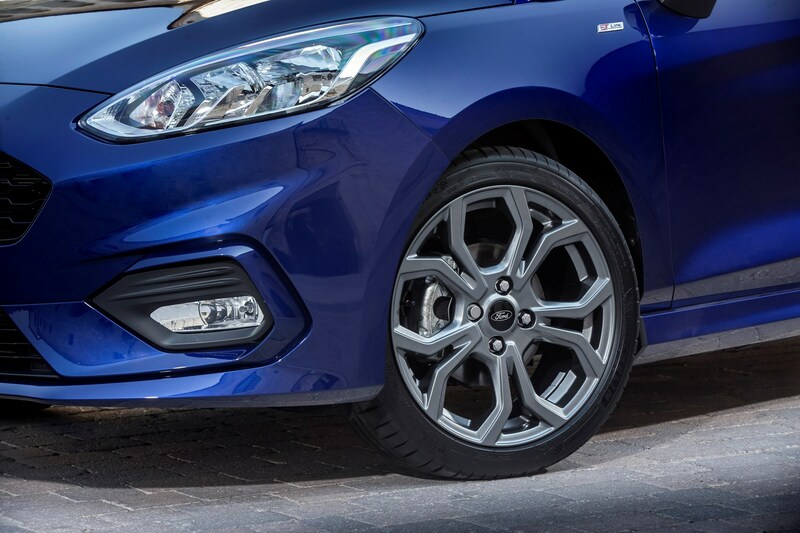 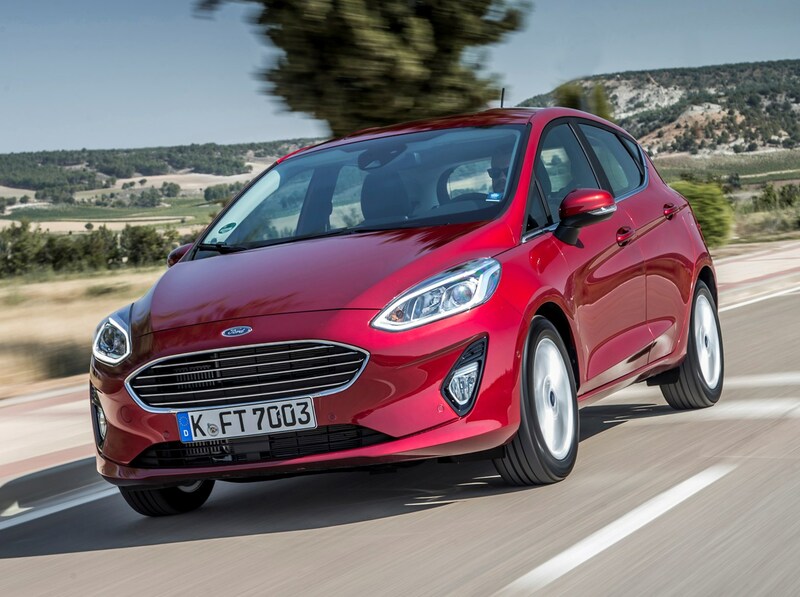 This is because Ford has significantly re-engineered the Fiesta’s chassis for this model, with even more responsive steering and a 10mm ride height drop to keep bodyroll in check. 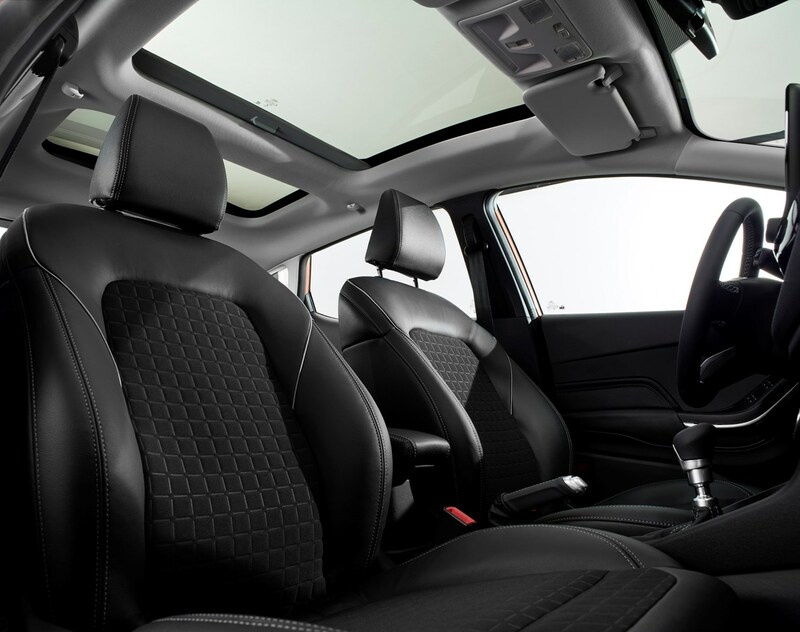 While it’s fair to assume ride comfort should suffer as a result, we found the difference – during back-to-back evaluation – to be minimal at worst. 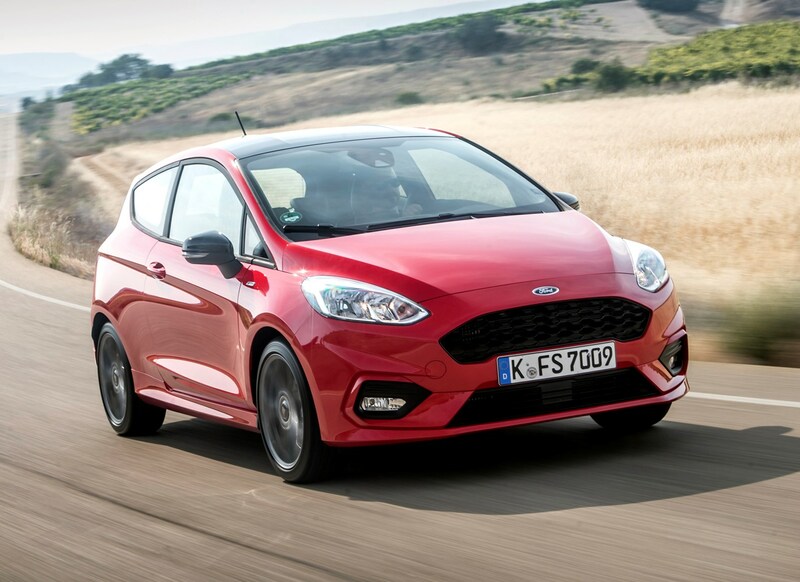 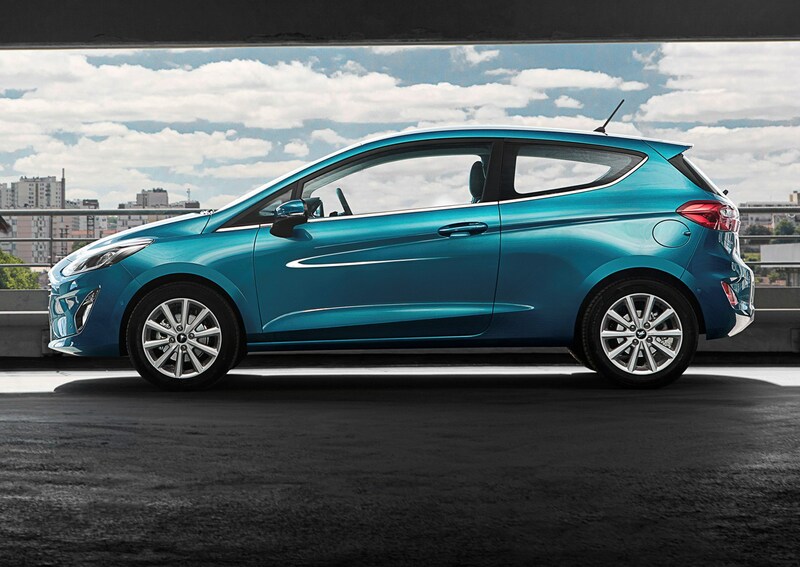 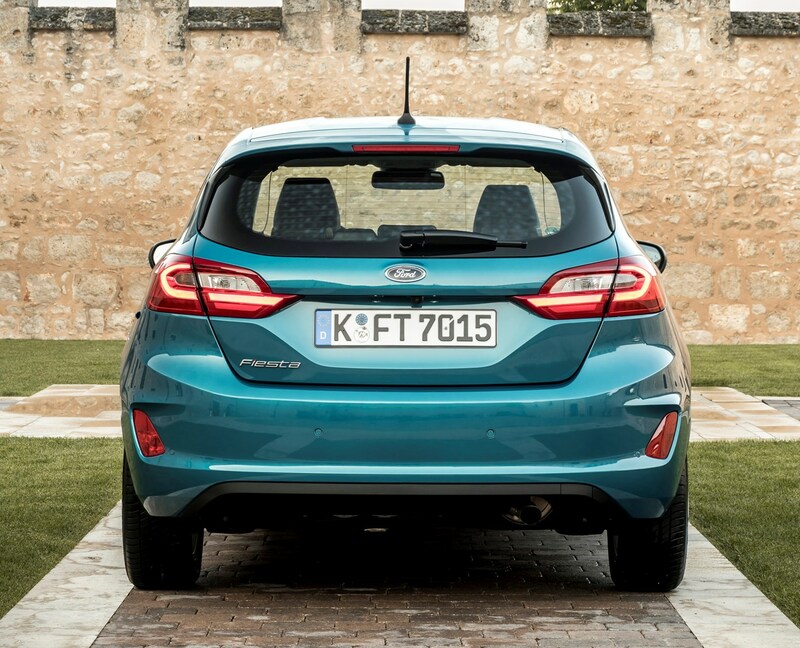 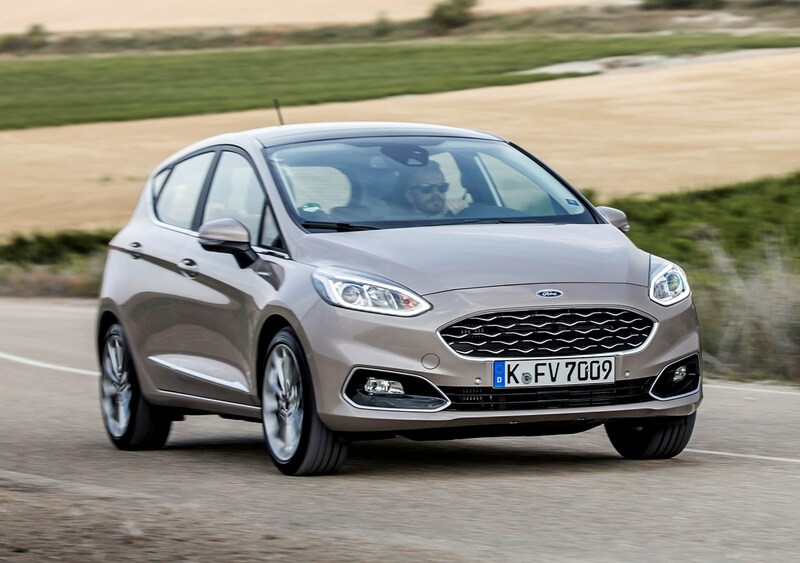 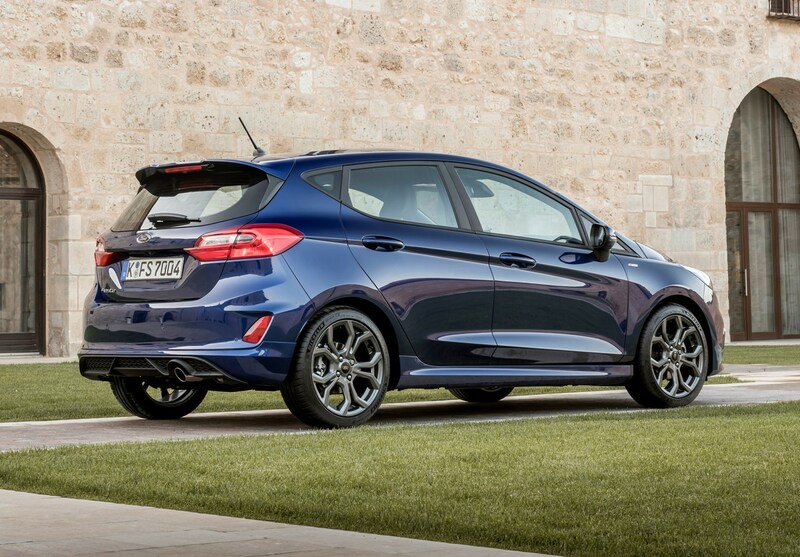 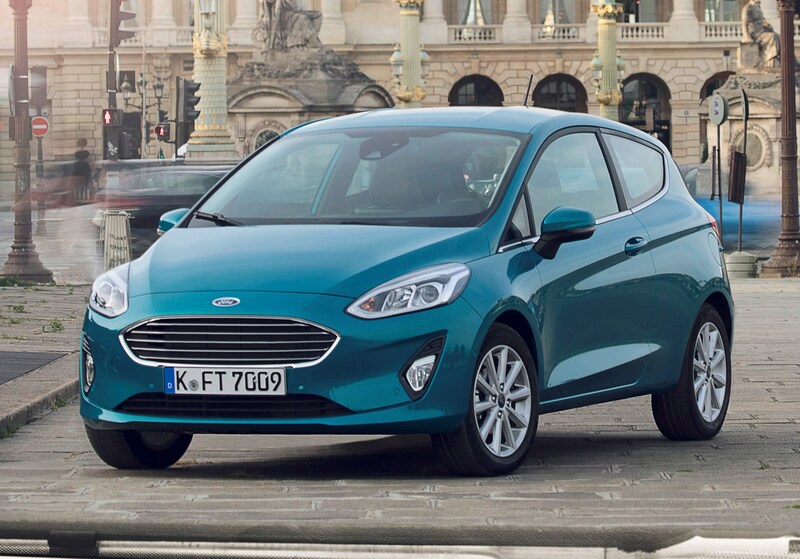 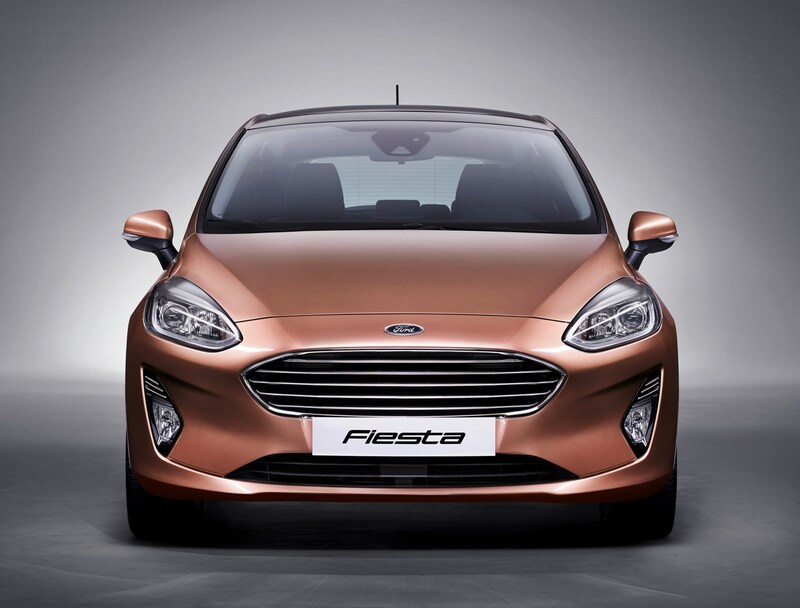 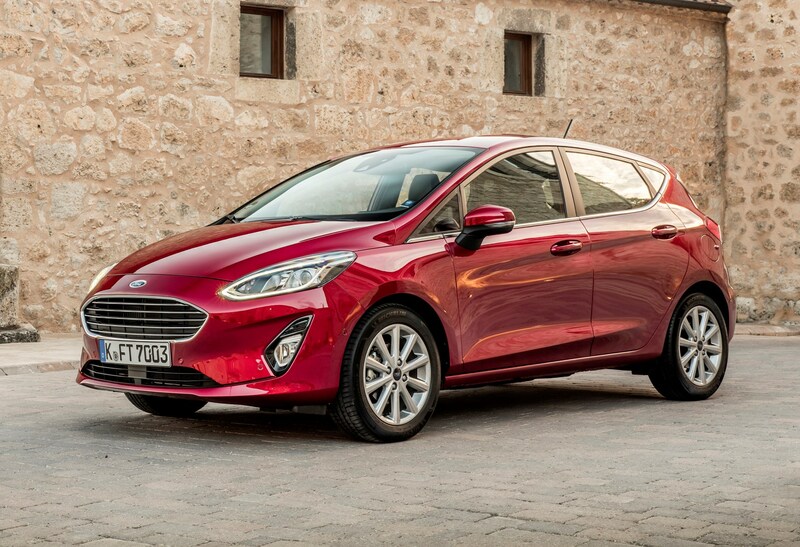 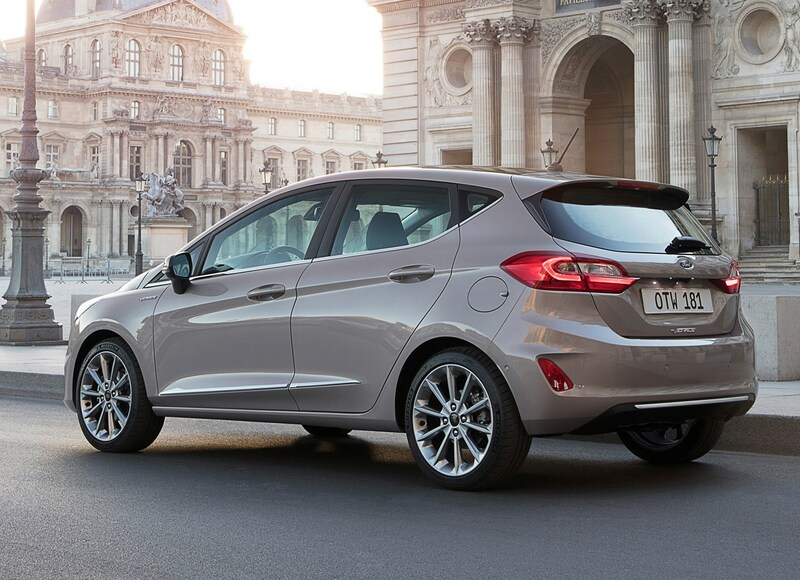 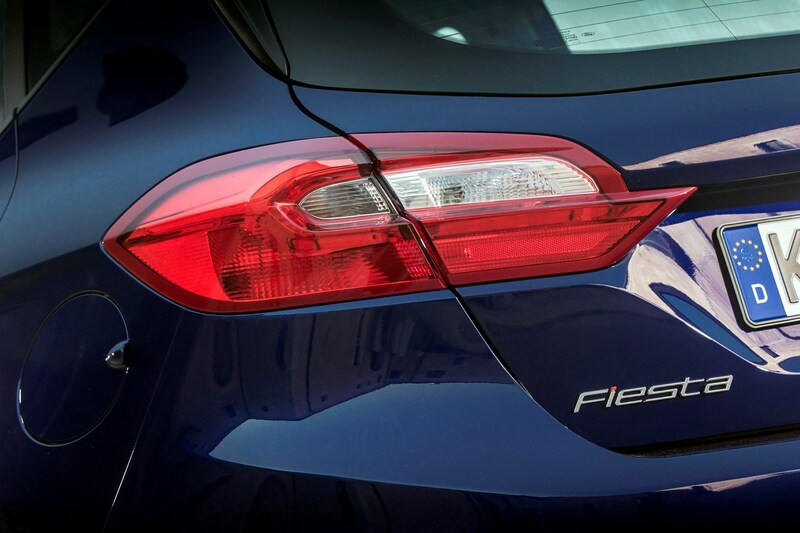 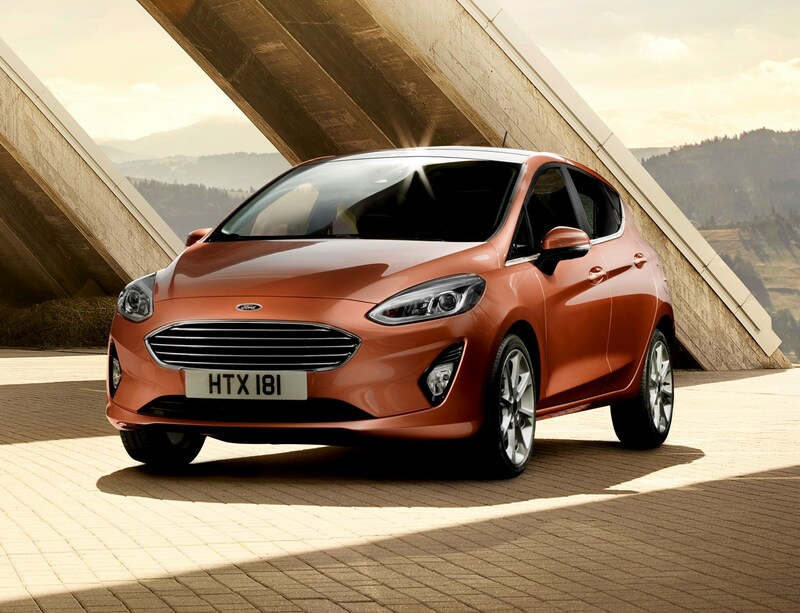 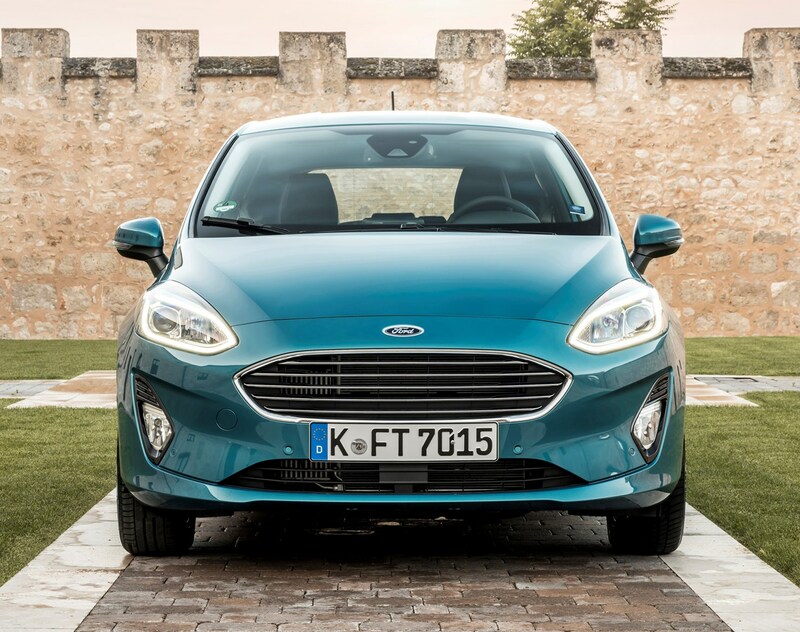 To really appreciate the Ford Fiesta, you’ll want to take one of these for a test drive. 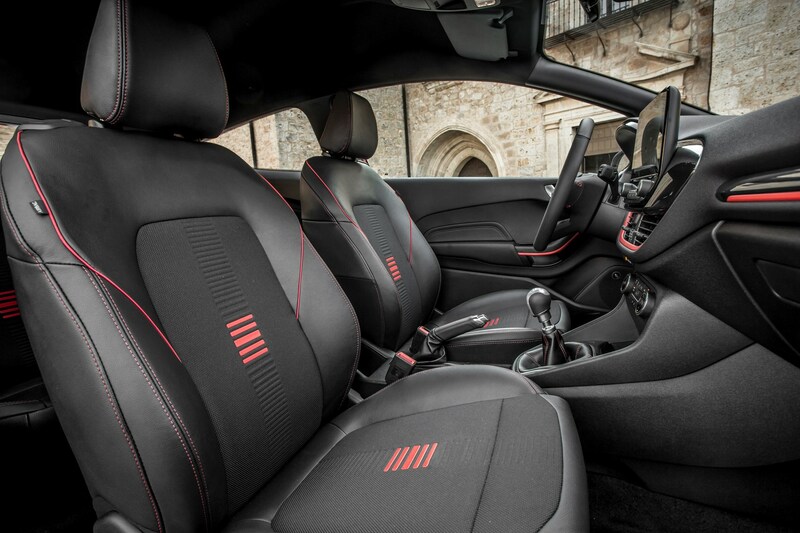 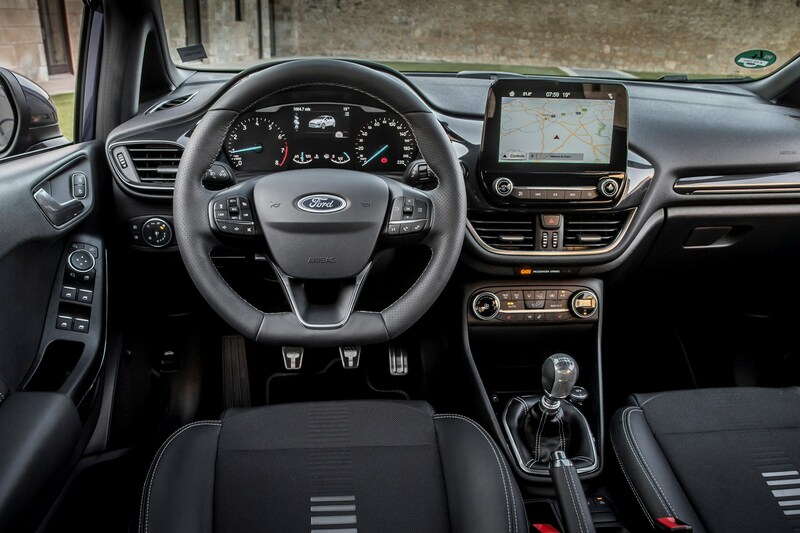 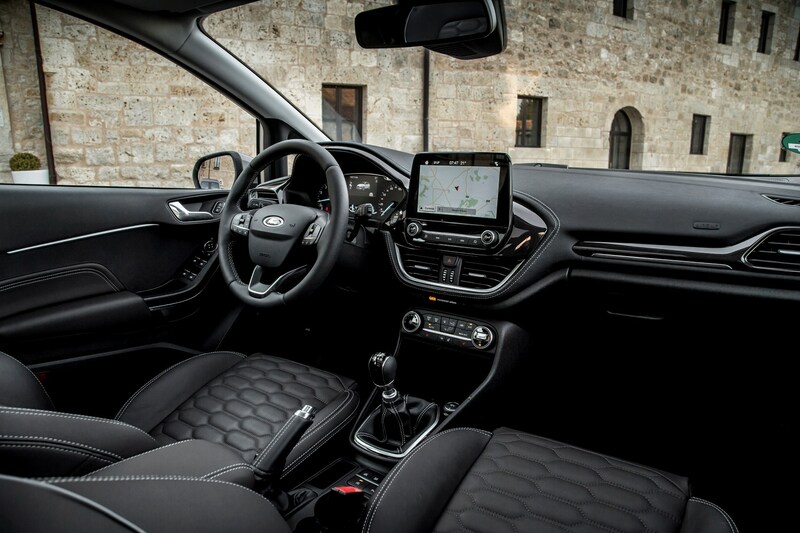 It’s fair to say the interior of the Fiesta has been given a significant uplift in quality and style. 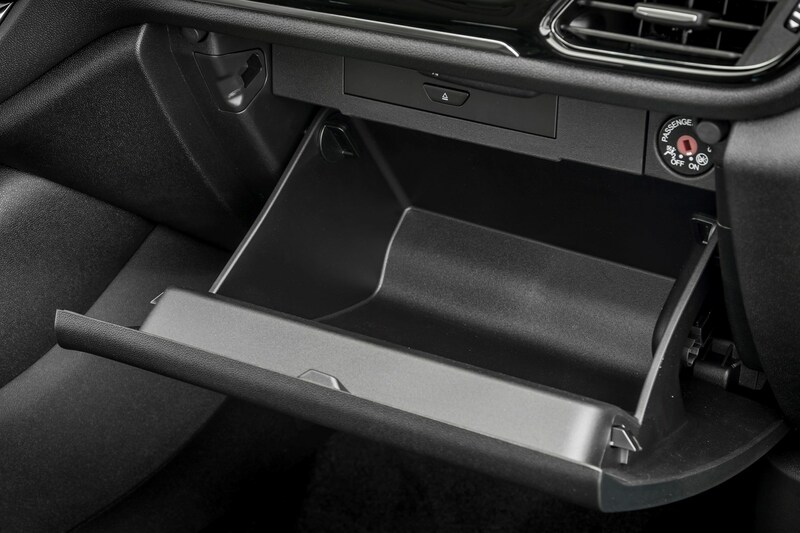 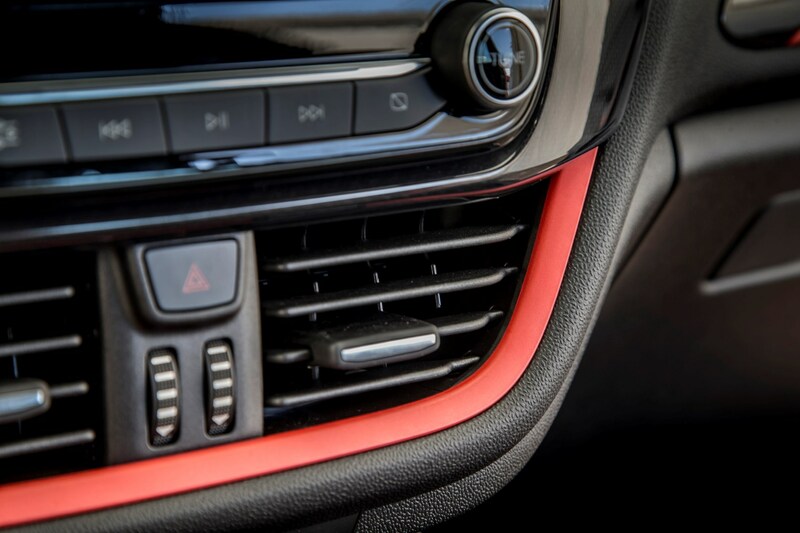 There are soft-touch plastics around many of the visible areas, but there are still a few places – especially on the doors and lower down near the footwells – that have what feels like cheaper materials instead. 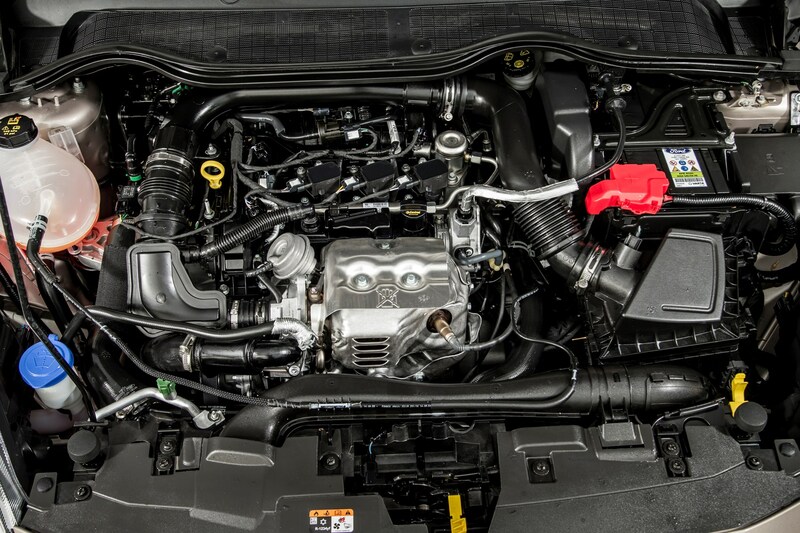 This is where you can tell that this is a car built to a cost. 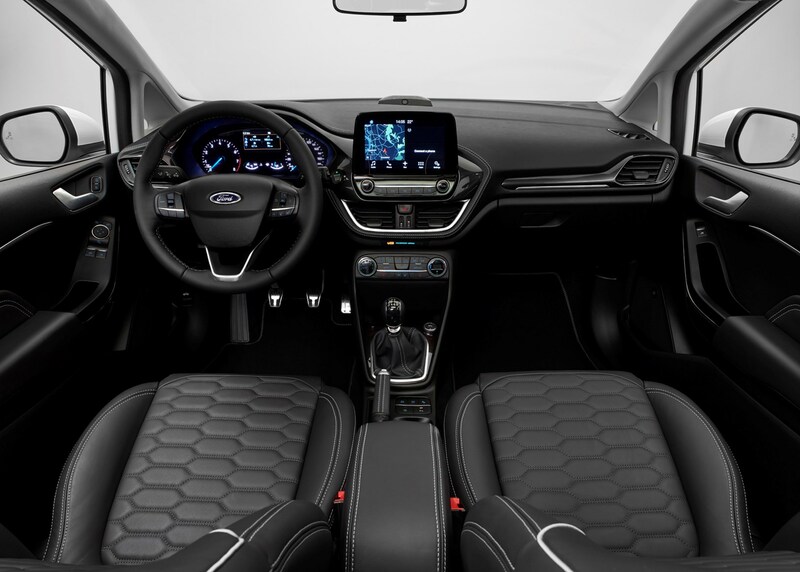 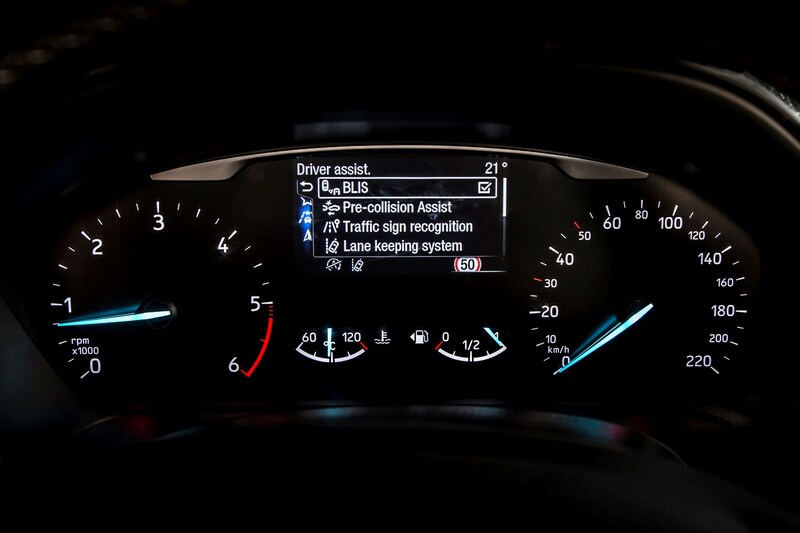 In the versions we’ve driven so far, the Ford Fiesta’s cabin is dominated by the huge infotainment touchscreen you get on higher-spec cars. 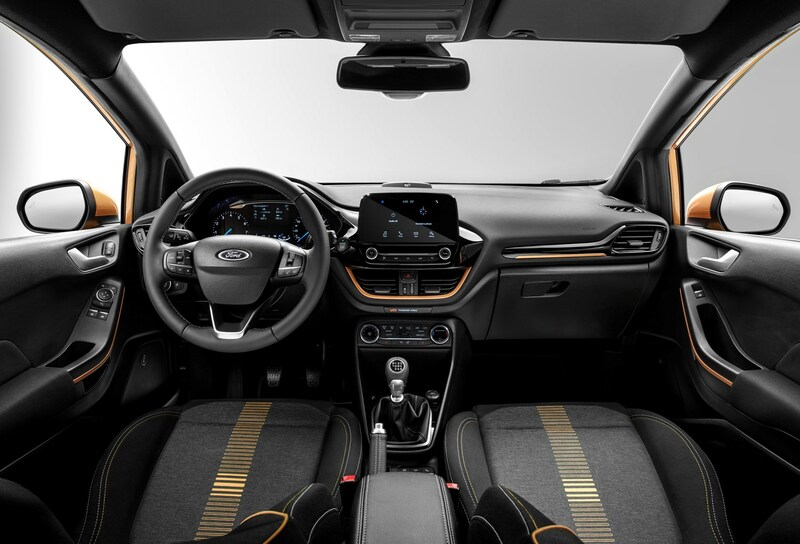 Finished with a gloss black surround, it’s in keeping with the rest of the cabin’s finishing, and actually helps draw your eye away from some obviously cheaper materials found as you begin poking around the interior. 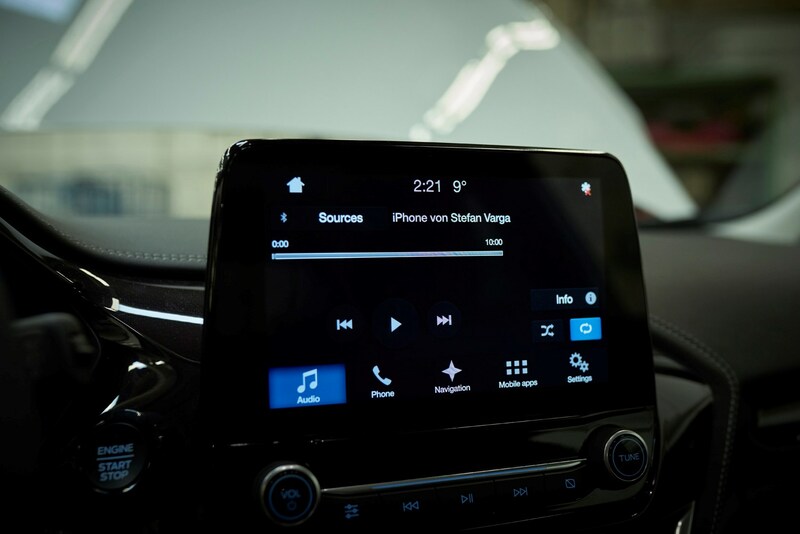 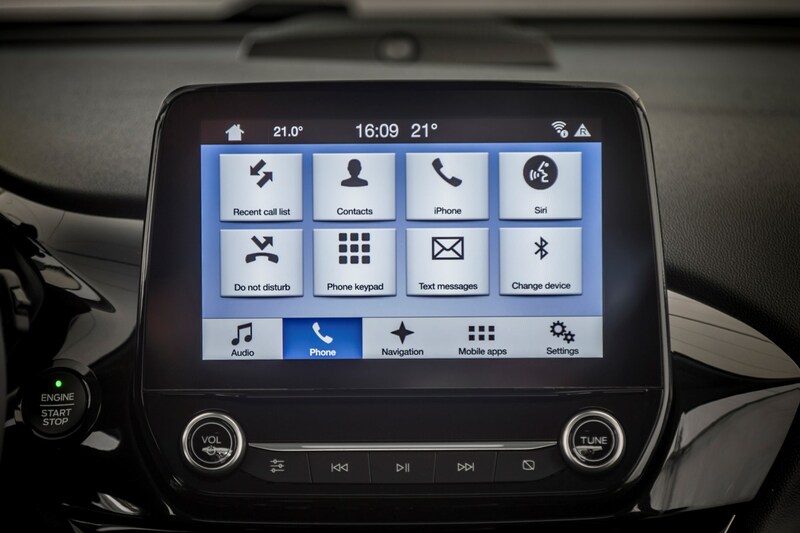 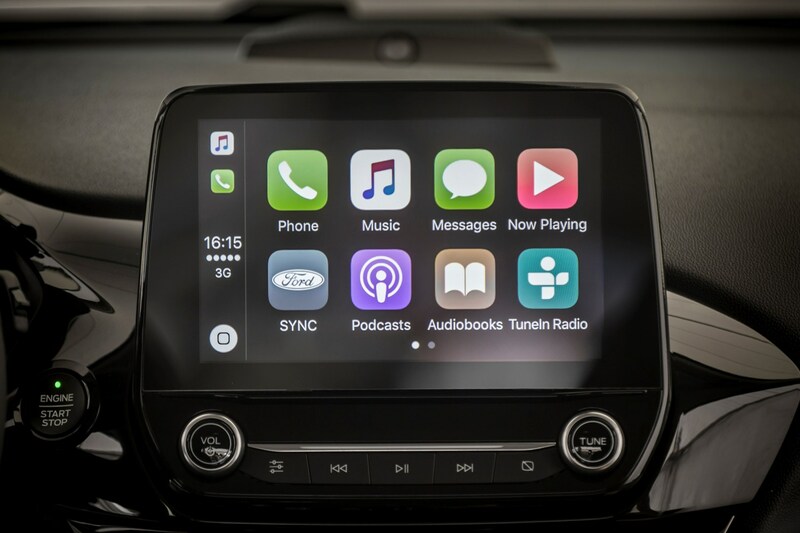 The Sync3 infotainment system works well, though – the screen is ultra-responsive and the menus very intuitive, backed up by a processing power to enable quick pinch-and-swipe actions on the sat-nav mapping. 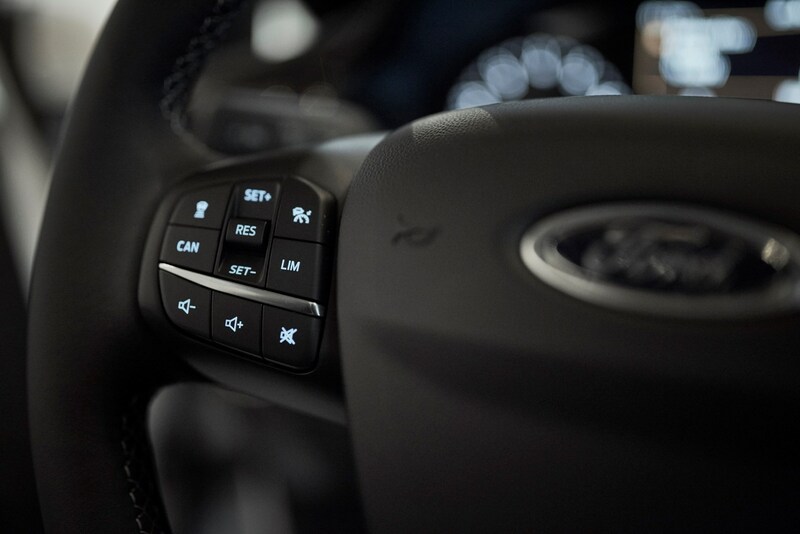 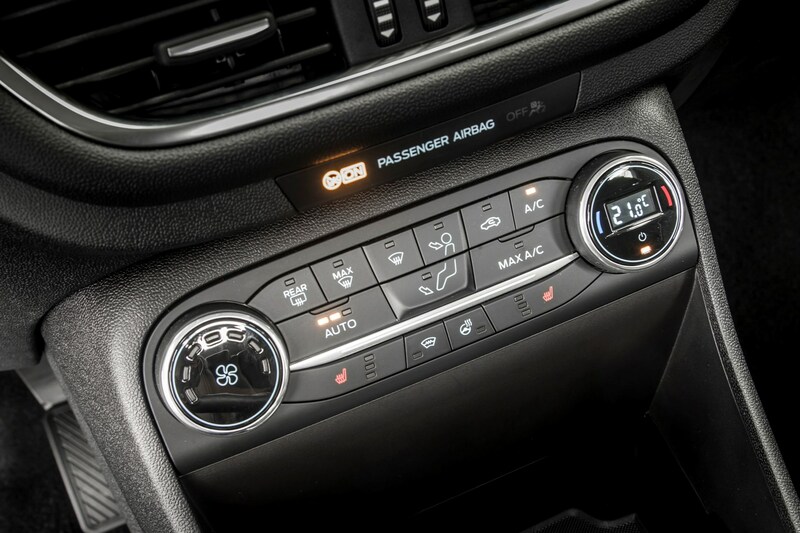 Ford hasn’t lagged behind when it comes to in-car entertainment, and this system feels right up-to-date. 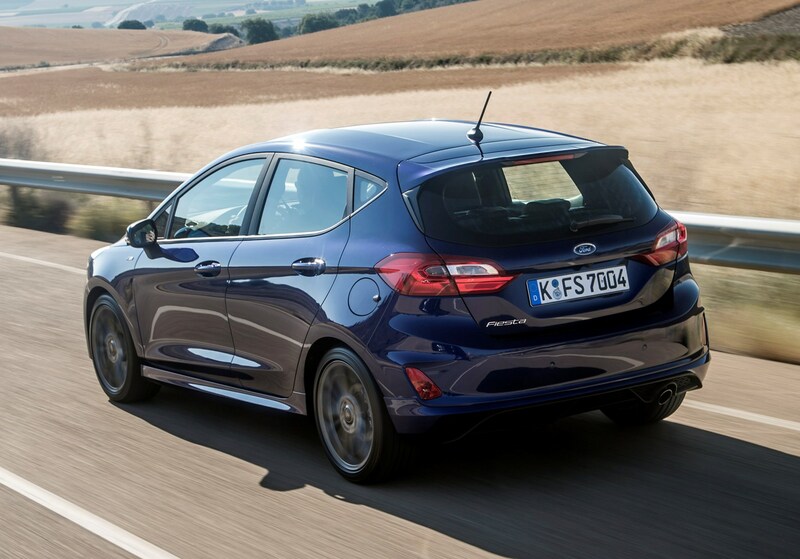 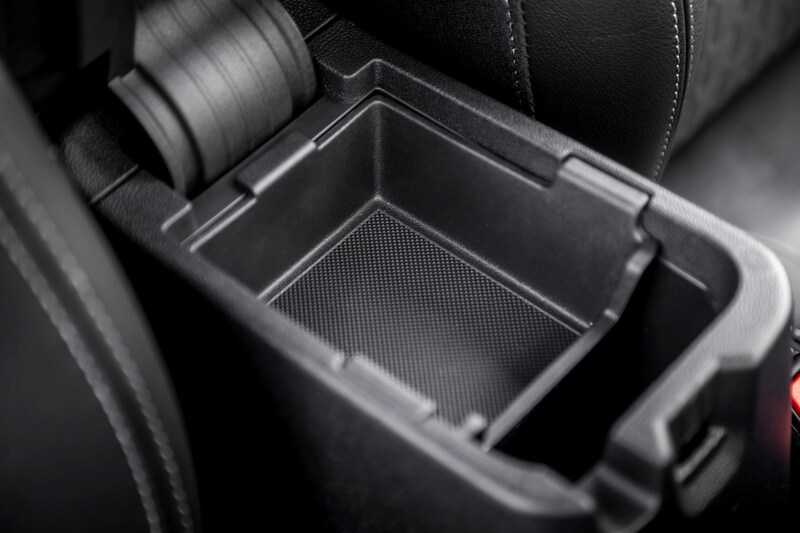 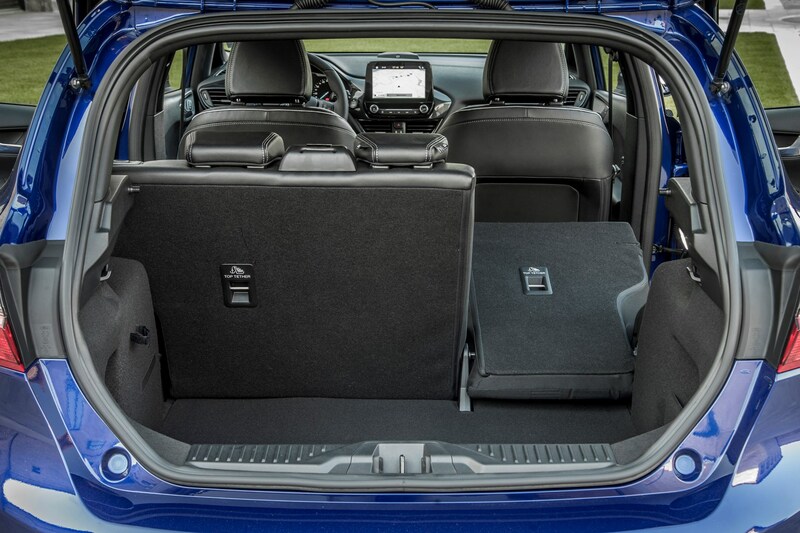 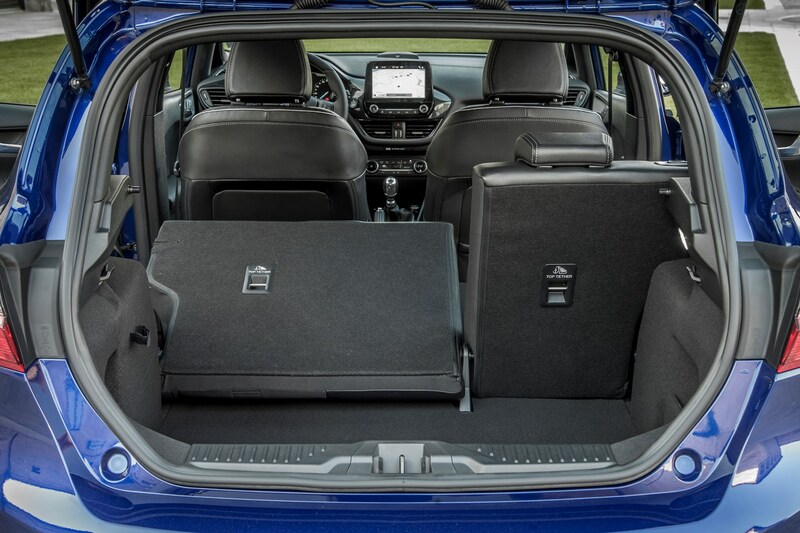 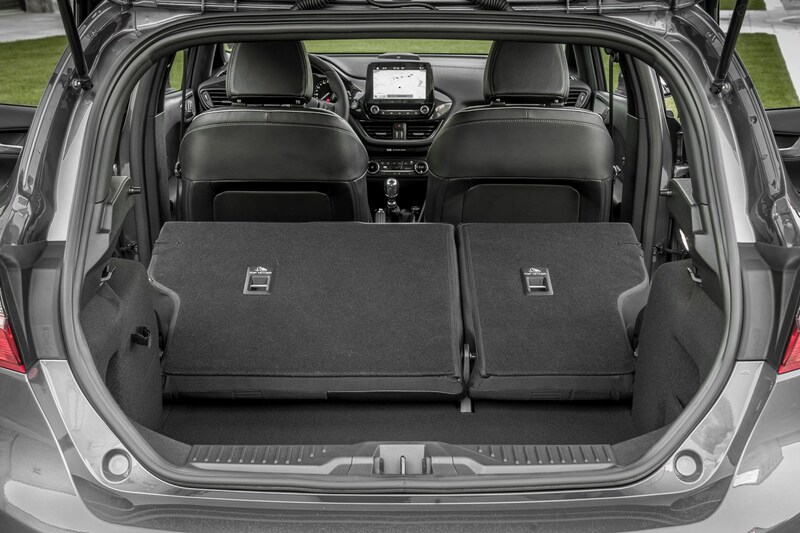 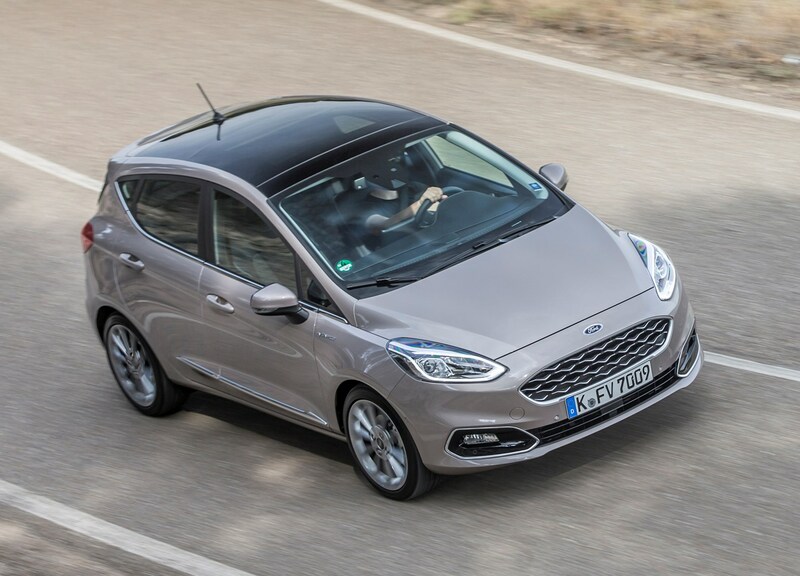 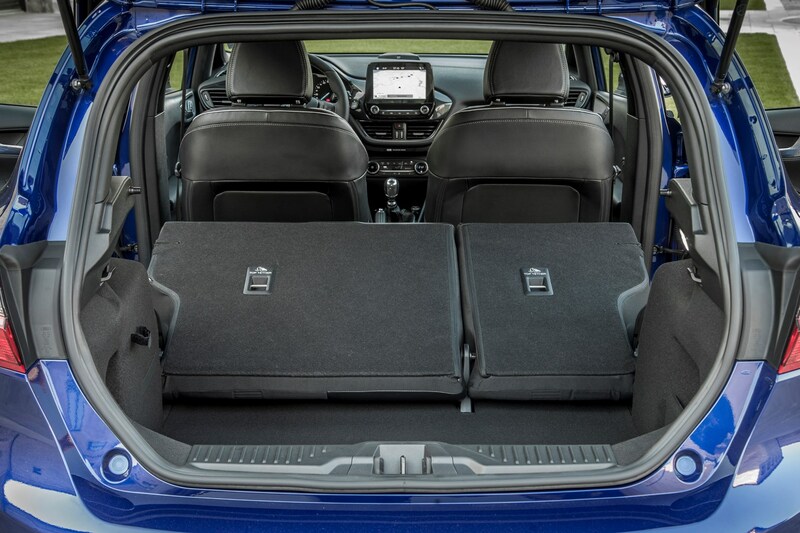 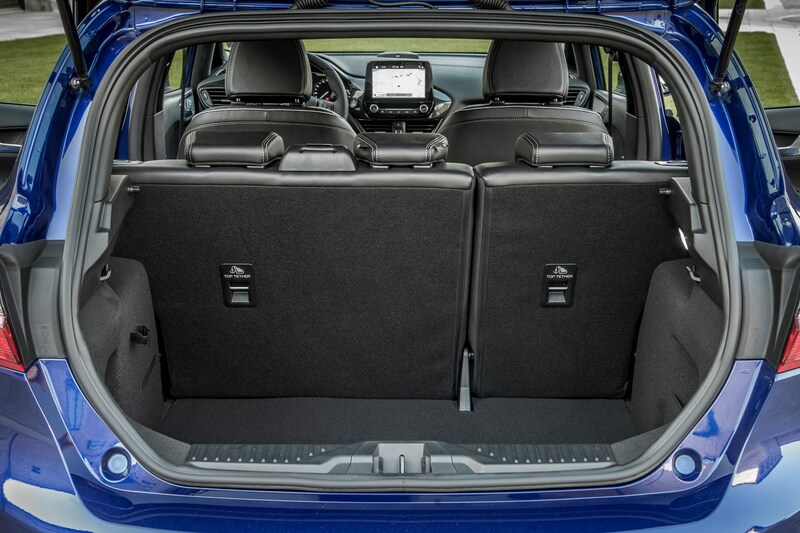 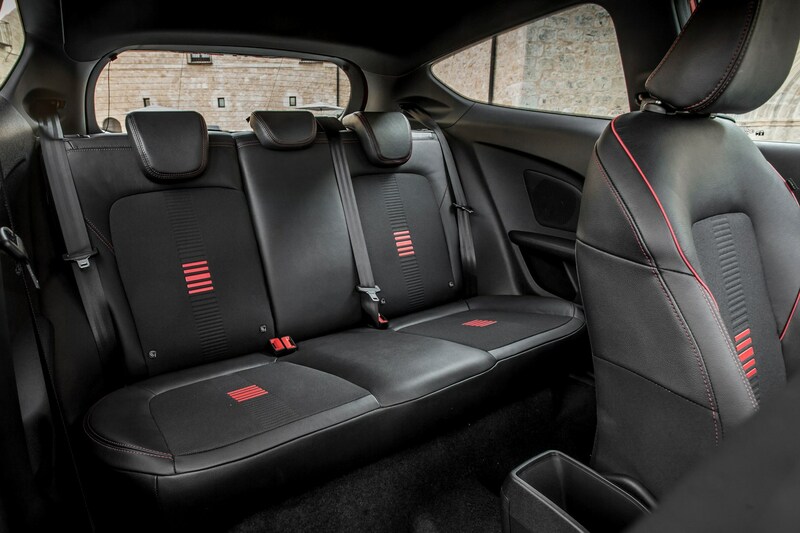 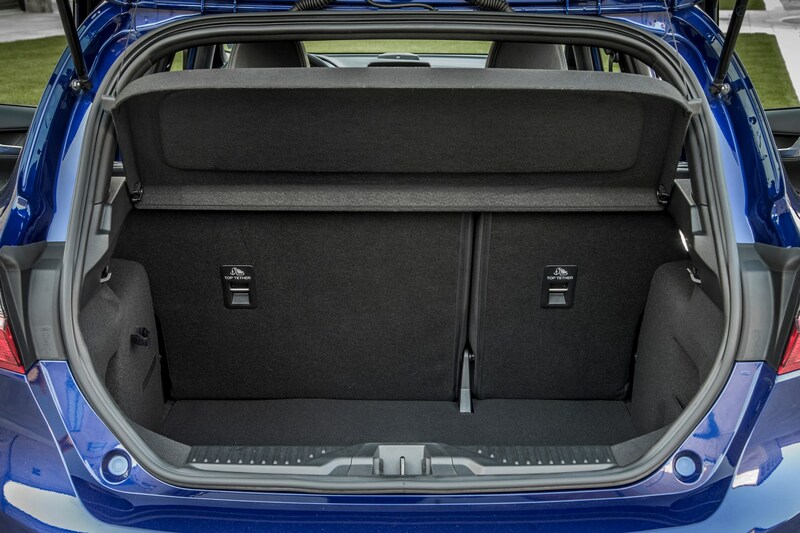 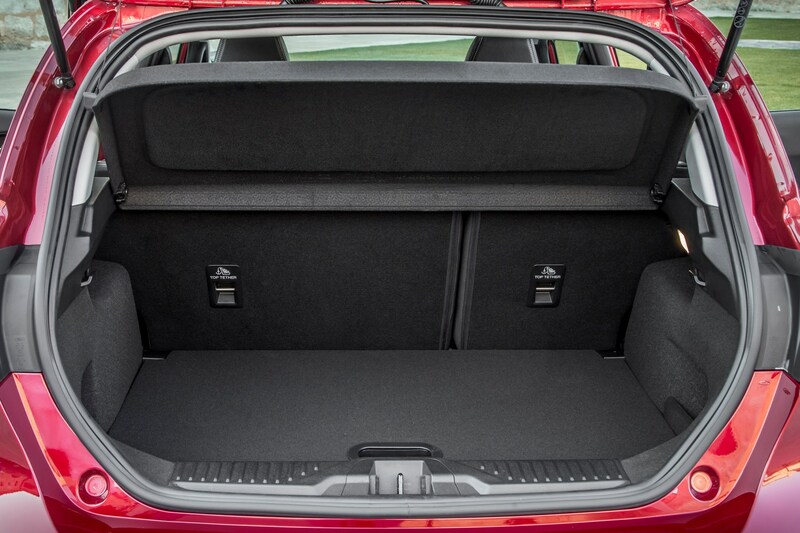 While the covers take various forms depending on the trim level, the seats themselves are the same on all Fiestas apart from the ST model, and we found the front seats especially extremely comfortable and supportive. 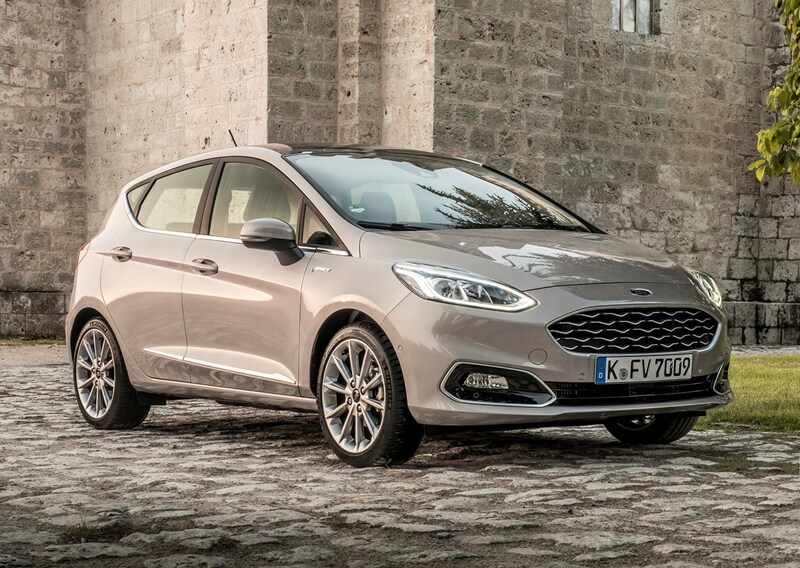 To take aim at the likes of the DS 3 and Audi A1, the Fiesta line-up now includes a Vignale. 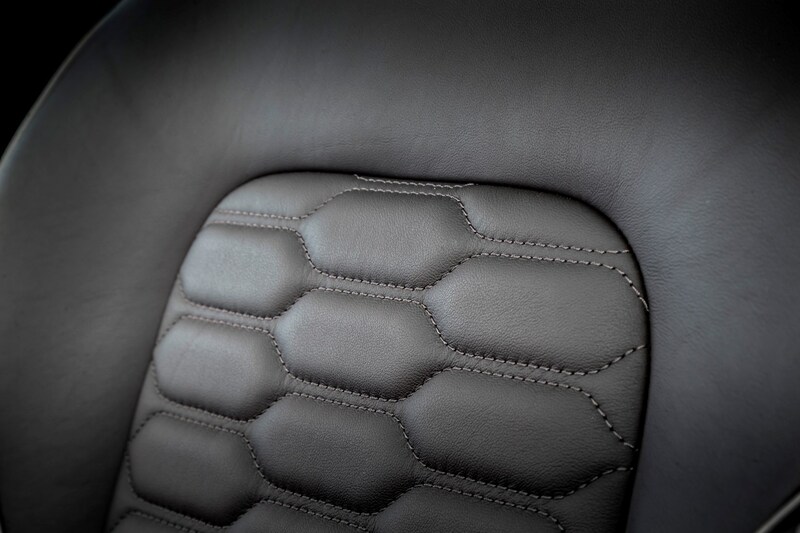 This means you can expect quilted leather upholstery for the seats (but false leather on the dash) and a very high level of standard equipment. 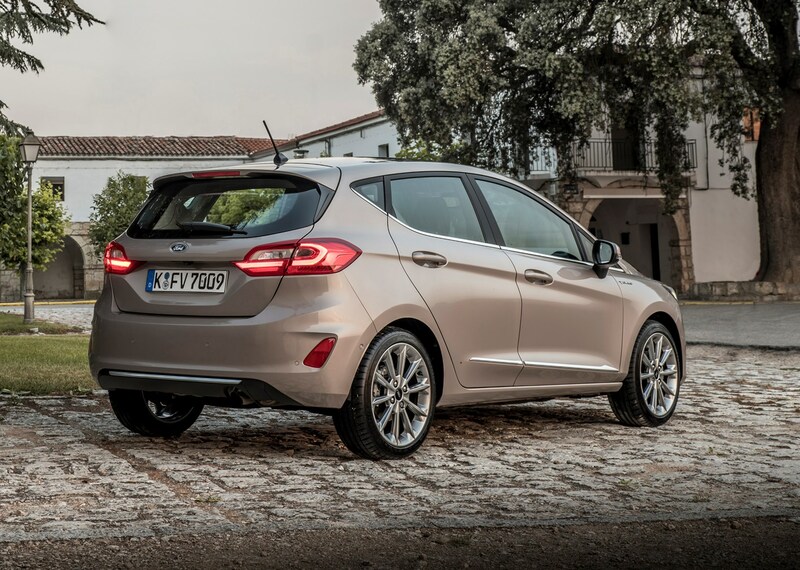 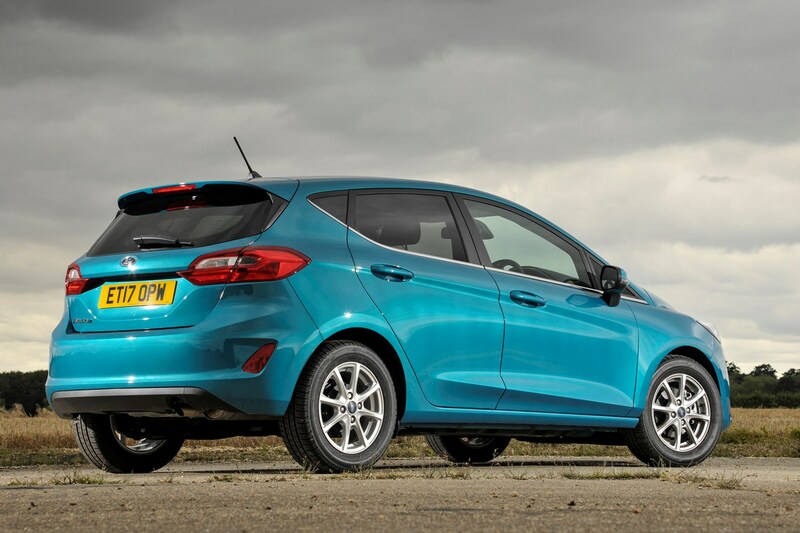 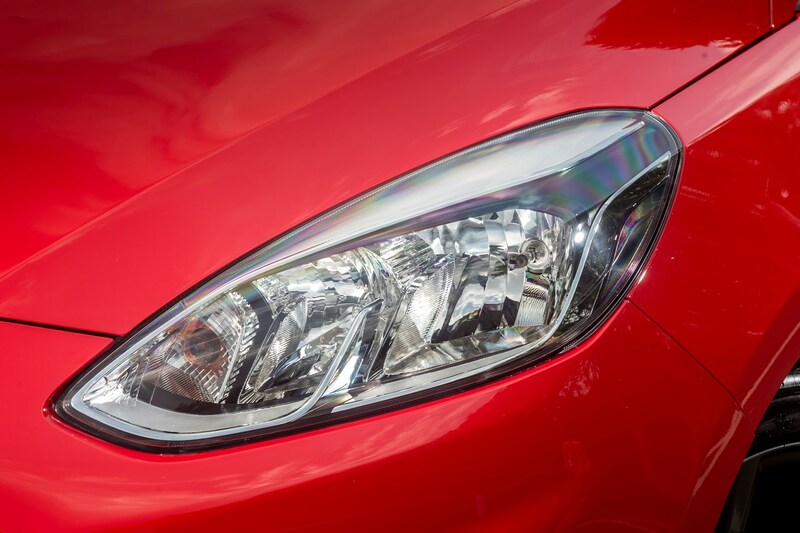 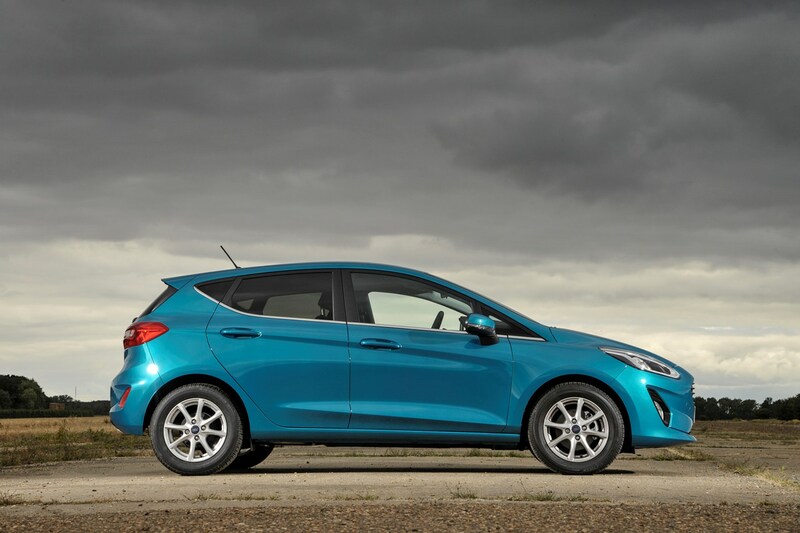 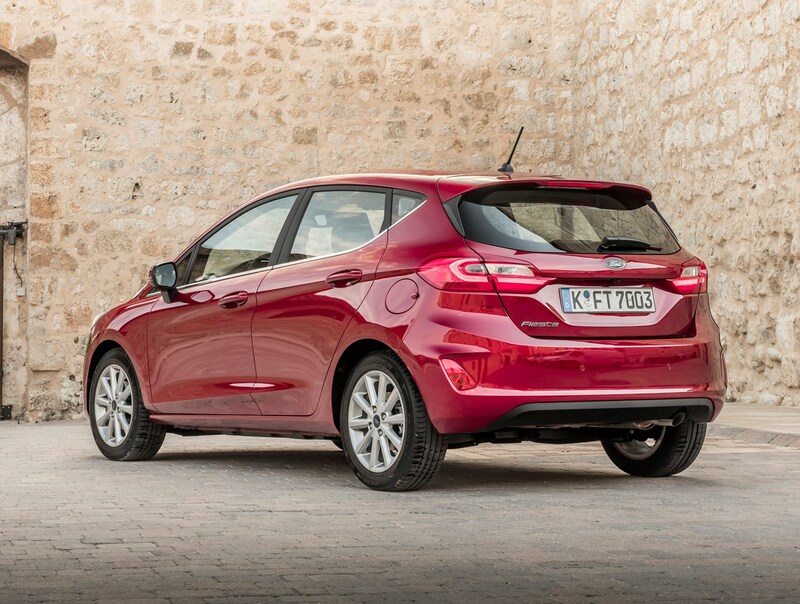 This is another area the Fiesta has seen dramatic improvement compared with its predecessor. 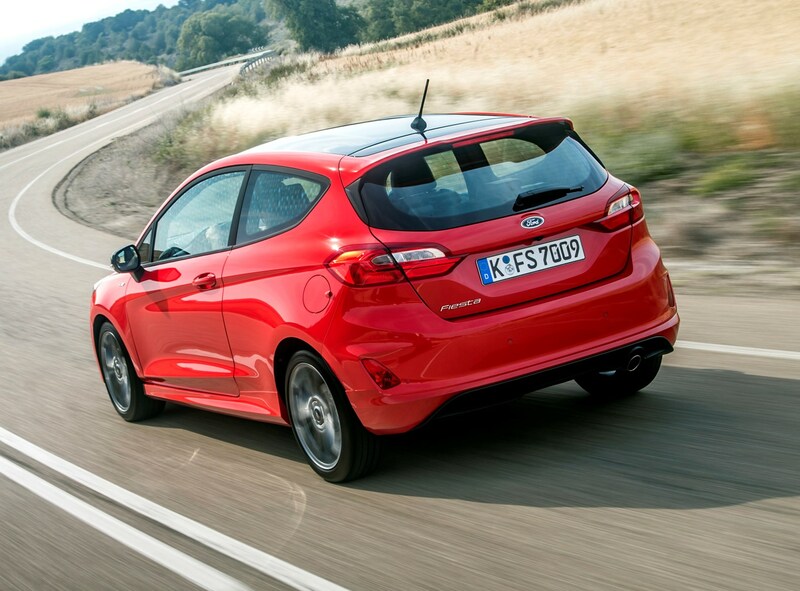 We were particularly impressed with the lack of wind noise at motorways speeds during our test drive. 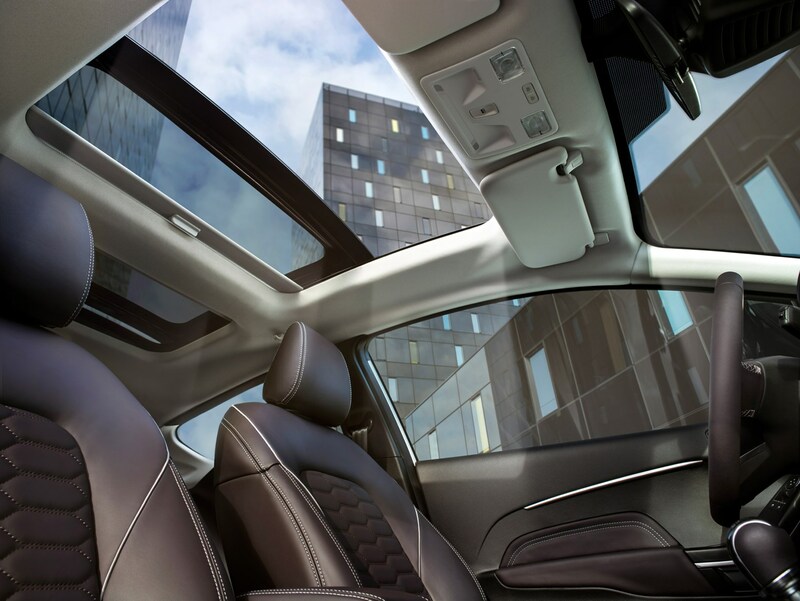 Once again we have to warn against ordering the panoramic glass roof here – it makes for a far more blustery experience even with the glass shut. 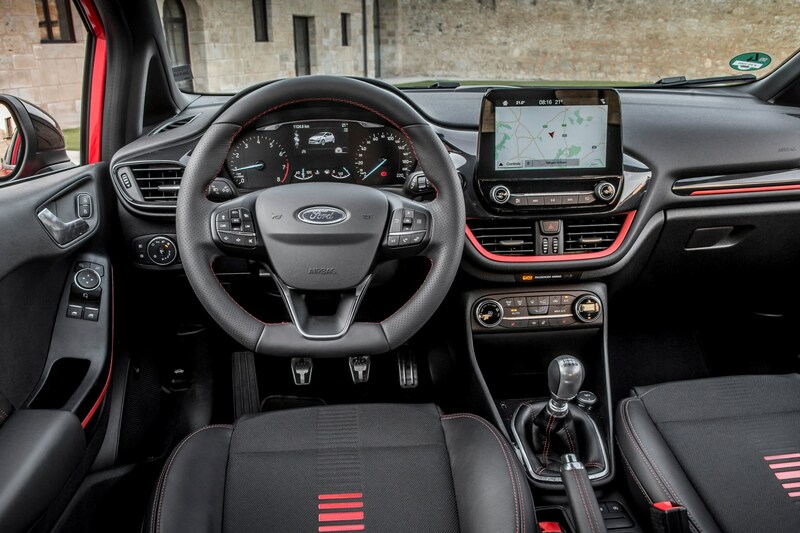 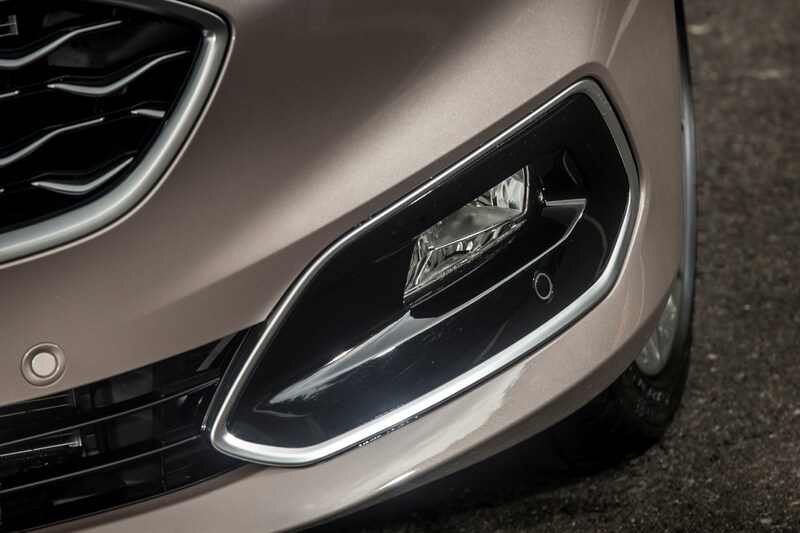 That’ll be a problem for Vignale customers who get this as standard. 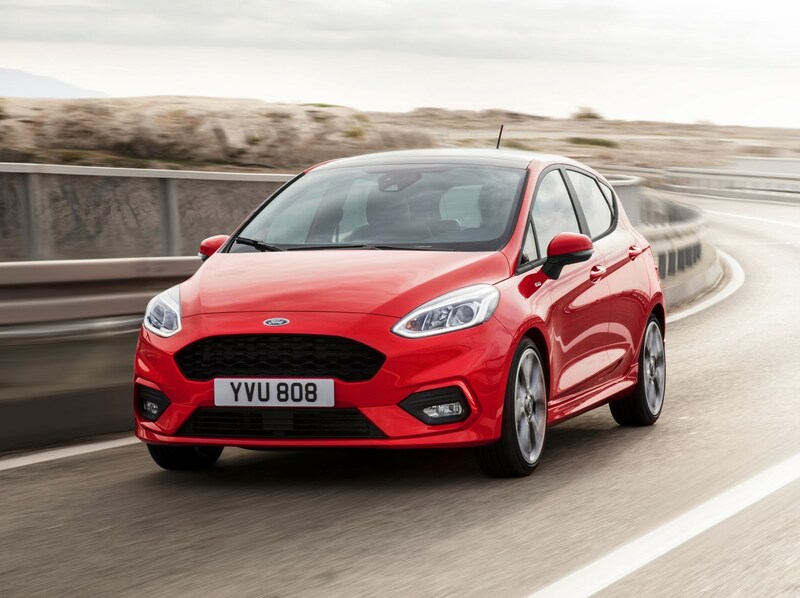 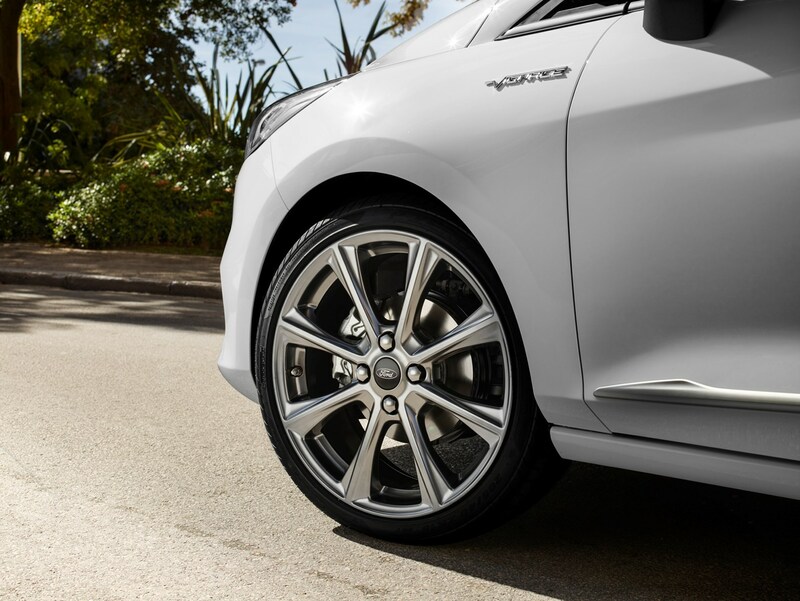 Engine and road noise is well-contained, and the excellent suspension not only does a great job of soaking up bumps, but settles back down so quickly that it’s always ready for the next one. 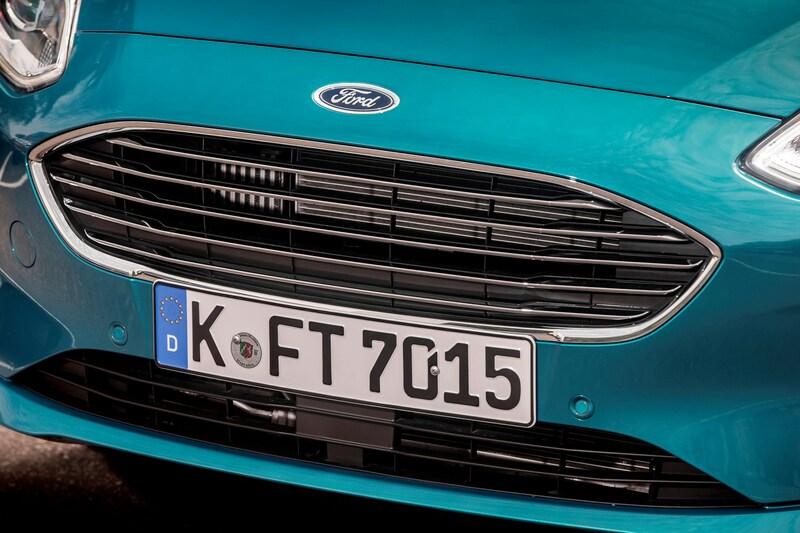 Ford’s engineers spend a huge amount of time on this, and it’s paid off. 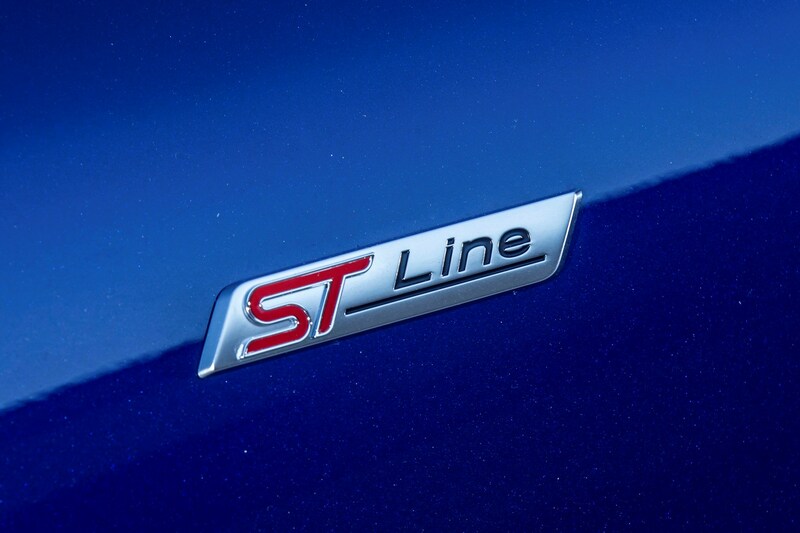 The ST-Line version has sportier-looking seats but they’re identical to the rest of the range underneath the snazzy covers, and the fractionally lower ride height doesn’t appear on first inspection to have a noticeable effect on the ride quality, which in the main is among the very best in the sector on all models we’ve tried. 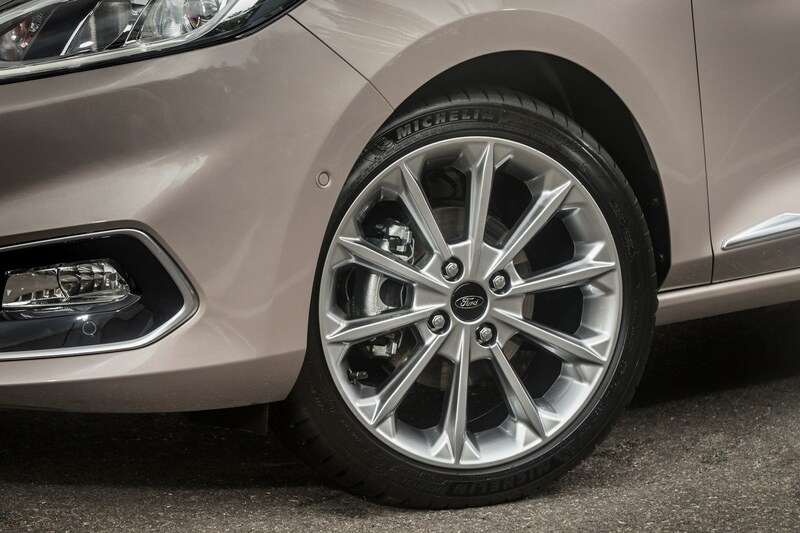 We’re confident the 17-inch wheels on the cars we’ve driven will work well on our poor UK road surfaces, but smaller 16-inchers are on hand if the ride is a little choppy.